Each entry below has a photo or illustration of a church. In most cases there are no (or inadequate) indications of where the church is, and unless you know the church personally, cunning detective work will be required to discover its identity. That can involve the building stone - is it knapped flint, sandstone or granite? Architectural styles can also help narrow the field, and for exterior views, the surroundings may also offer clues. And for postcards, the location of the publisher may be helpful. Sometimes of course, the mystery remains just that - some of the entries below have been unsolved for several years, and perhaps may never be solved. Once solved, the entry will move to the alphabetical list below, and, at a later date, archived here. If you enjoy the challenge of identifying churches, try here as well. 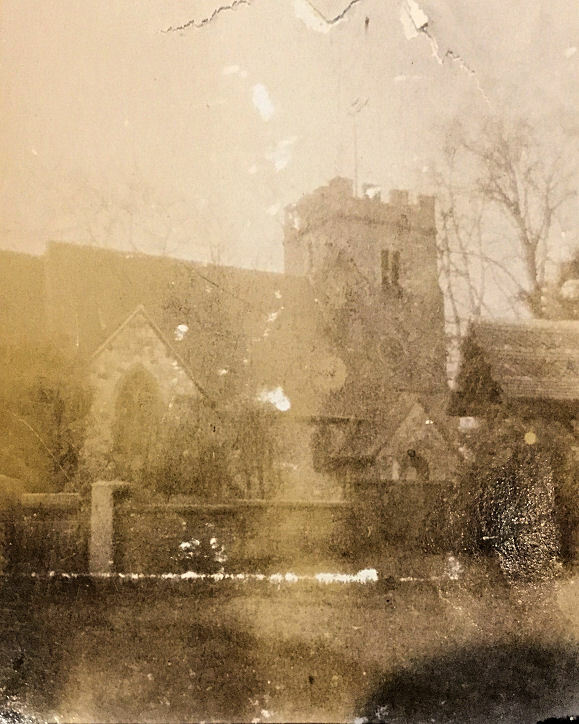 A photograph of a church, perhaps taken in Victoria's reign, possibly either in Flintshire (maybe near Mold or Buckley), or Cumberland (perhaps in the Maryport/Dovenby/Little Broughton area). © David Knowles. 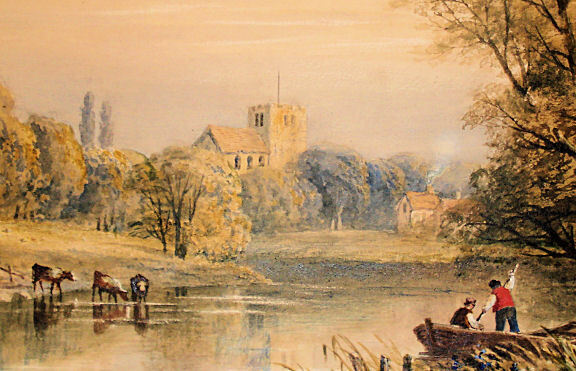 Paul Way is seeking help with the location of a church in a painting. It was handed down by a relative who lived in the Hove area, but of course it may not be from that area. The artist is unknown, but it probably dates from around 1850. Close-up. 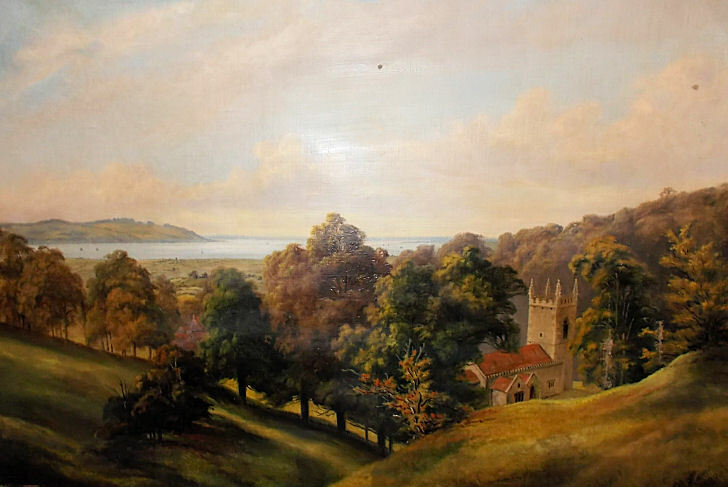 Simon Davies has tentatively suggested St. Andrew at Steyning, West Sussex, painted from across the River Adur. He admits that the artist has taken some minor liberties, but I think the suggestion has merit. Here's a modern photo (unfortunately not from the same angle). Tony Preston visited recently, and has sent in this photo which is a little nearer to the angle of the painting. 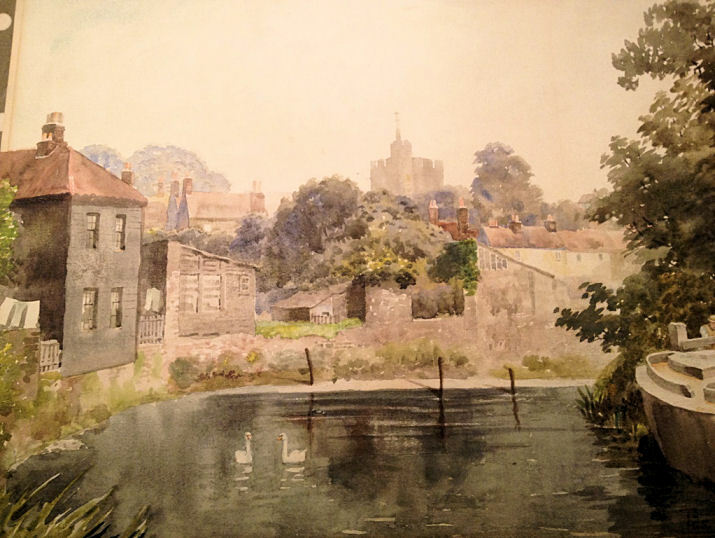 He advises that the painting is unlikely to be the view from the River Adur, as it is too distant (at least, it is today), but that there was a smaller river closer to the church, as shown on a map of 1897. Big enough to warrant bridges, today nothing remains of it other than an overgrown ditch. 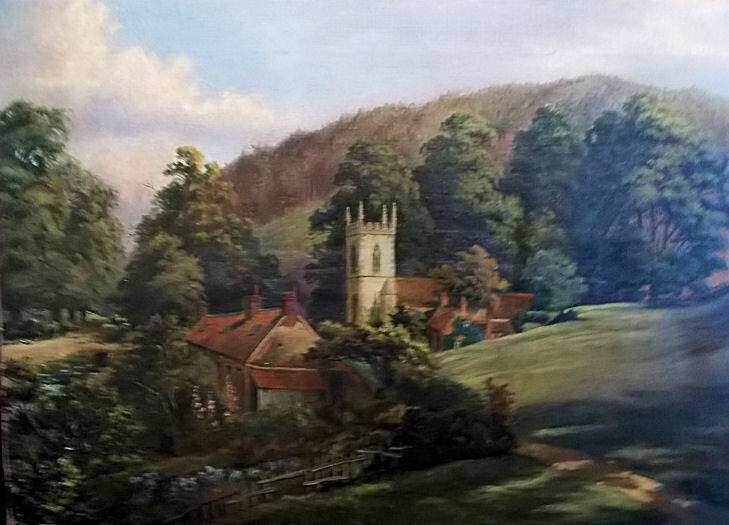 Overall, his conclusion is that the painting is still possibly Steyning, but the case has yet to be proved. ". 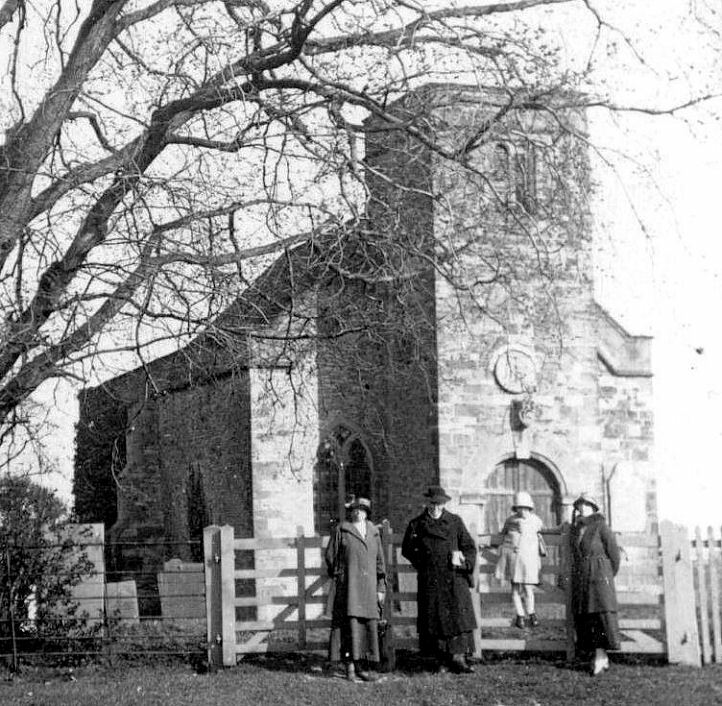 Do you have an old photo or illustration of this church which could prove or disprove Phil's suspicions? 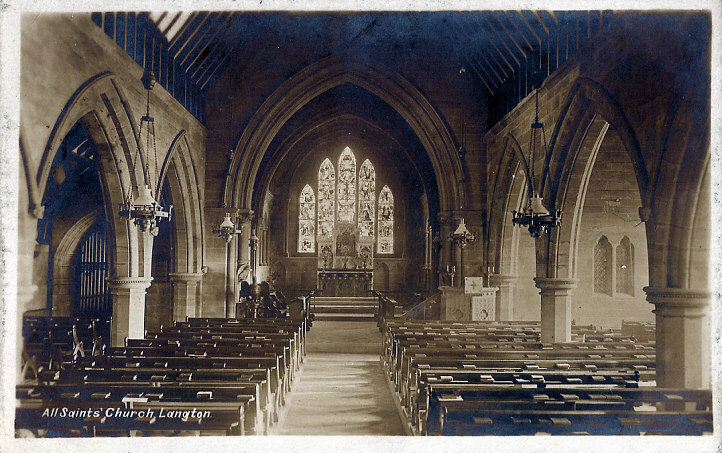 Judy Flynn's Collection has provided evidence in the form of an old postcard, undoubtedly of Langton Green, and although there are many similarities, the differences seem to rule it out as the location of the unknown postcard - see for example the profile of the aisle arches. The postcard was posted in 1913, so the photo pre-dates this. Ian Lewis has sent in the unveiling of a war memorial. It may possibly be in Cumbria, but can you identify it? Ian has also sent in this old photo in the hope of an identification. 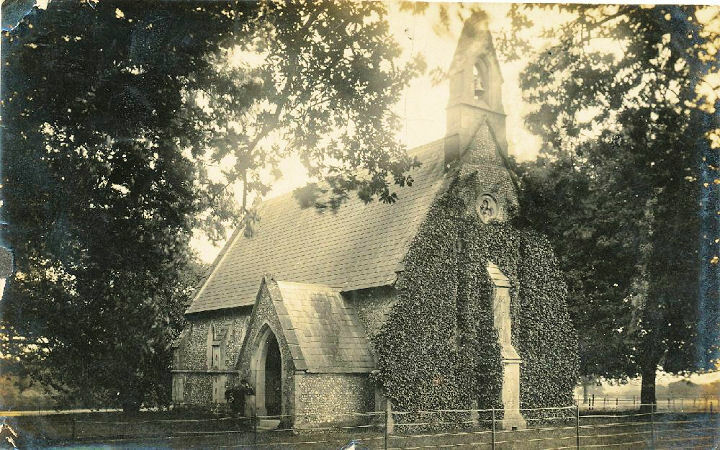 A Sussex church, probably in the Brighton area. Can you advise Stefan Bremner-Morris where it is? Now solved. Brian Curtis has identified it as the Town Hall at Launceston in Cornwall. Stefan - the email address I have for you is no longer valid. Peter Boyce would like to learn where this painting was produced. It's by R. O. Dunlop R.A. whose floruit was in the 1950's and 1960's. He lived near Chichester, and painted widely in Sussex and further afield in southern England. 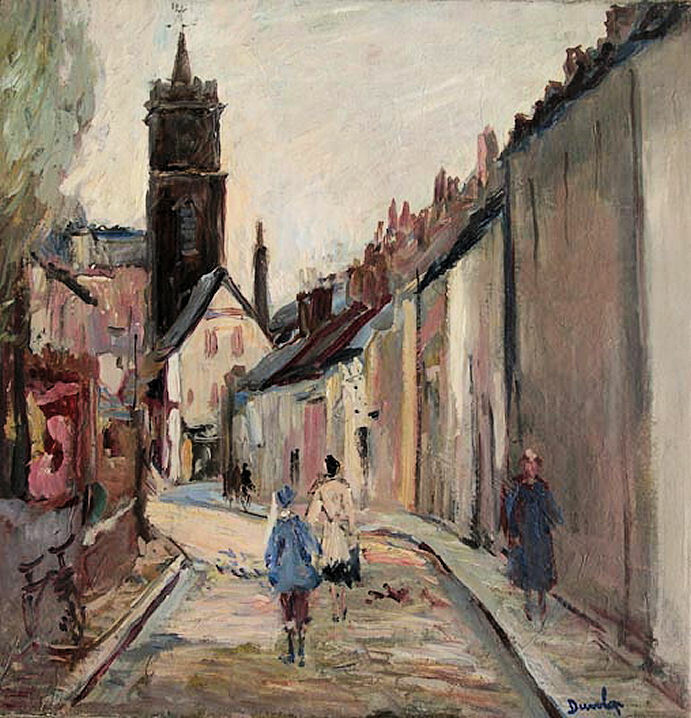 Colin Waters has identified the painting on this website, and it is called "Old Street, Bognor". Unfortunately, there isn't a thoroughfare called Old Street in Bognor, so this is just a generic old street. In a fine piece of detective work, Tony Preston has also been looking into this church. He points out that the website included earlier in this entry also has an image of a page from a magazine, wherein the painting is shown, with the title Old Bognor Street, rather than Old Street, Bognor, supporting my speculation that Old Street as such doesn't exist. It also includes a hand-written date of 1956 for the painting. 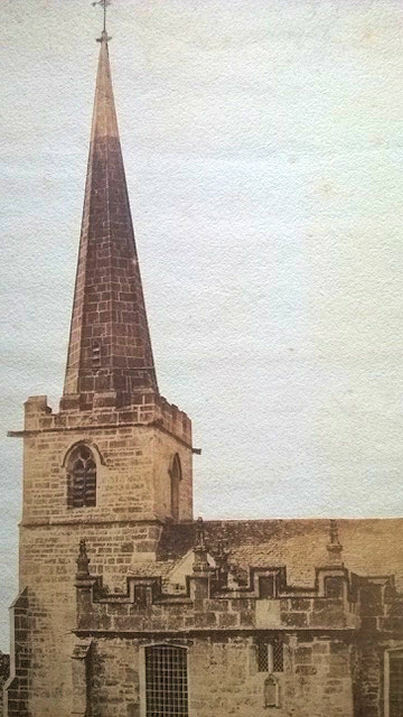 He has sent a link (here) to a website describing the church of St. John the Baptist, built in 1821, with a tower added circa 1834. 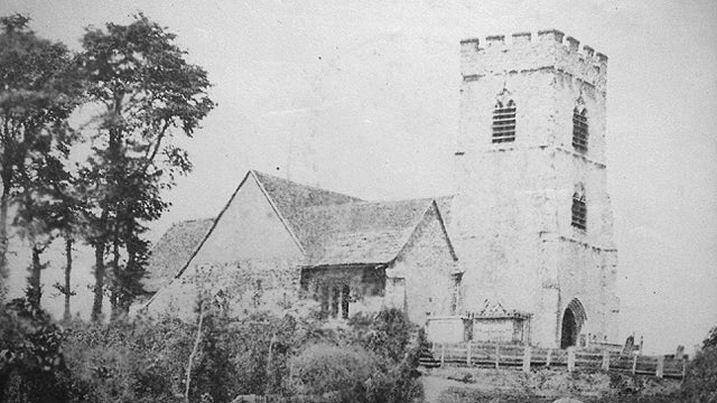 The church itself was demolished 1891, but the tower was left standing until 1961 (i.e. after the painting was made). 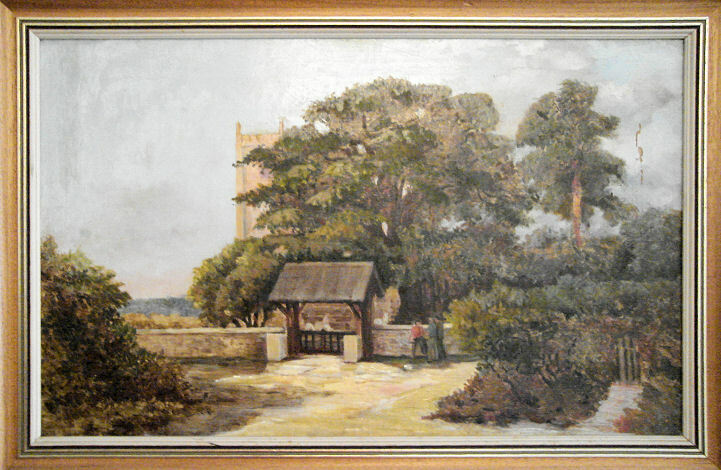 This link shows two postcards (scroll down) of Waterloo Gardens, both showing the church in the background, a good match for the painting. An old map shows St. John the Baptist's tower standing on Market Street, and comparing the painting with the map, I suspect that the view is from what was then Chapel Street, to the north of Market Street. Note that Chapel Street has since been re-routed from its original course. [Peter - the email address I have for you is invalid, so I hope you see this]. The following are all from John Bowdler's Collection - 3 an interior, 5, and 6 another interior, 10 is perhaps a private chapel. Brad and Steph MacDonald inherited these large framed photos (1, 2) from a relative who lived in North Cornwall. They believe they are over 100 years old. Can you tell them where the church is located? This one was always going to be very difficult, but worth the effort! 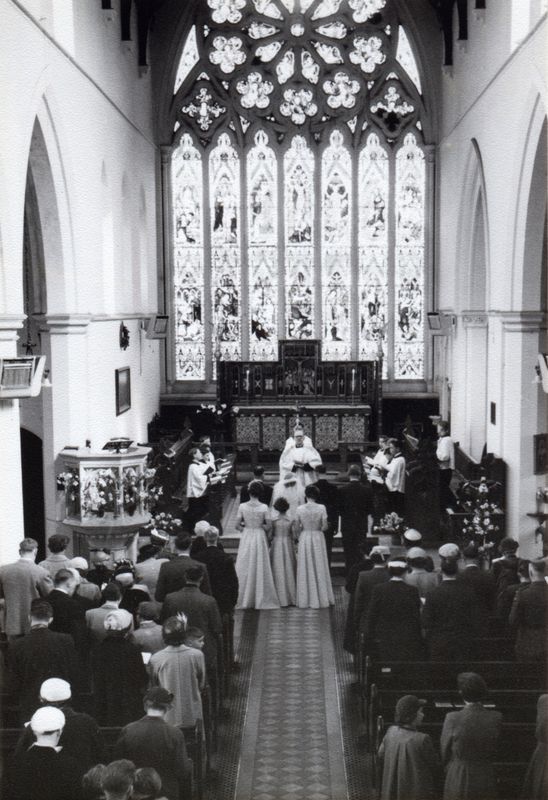 Simon Aldworth had asked for help in identifying the church in some wedding photos. 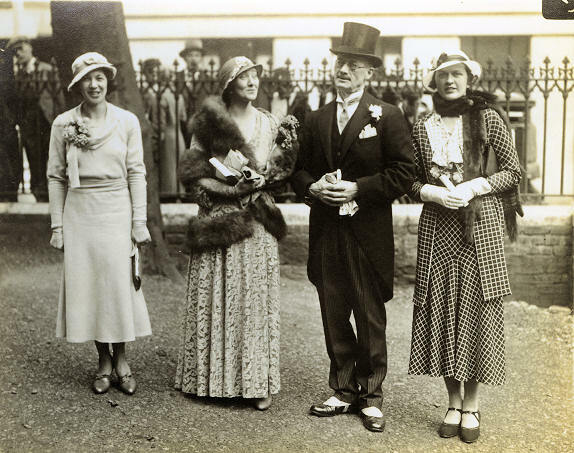 Although they are in a wedding album, in the family's possession, he doesn't know the people involved, who are named as "Russie and Jack", and who seem to have been married April 29th, 1933. The firm of photographers is still in existence, but they have had no luck in finding out any details either. The church is not shown clearly, but the windows may be identifiable to someone who knows the church well. Photo 1. Photo2. The next two show groups walking up the churchyard path, and standing against what appears to be the churchyard railings. The buildings opposite suggest a large town, which might tie in with the photographer who was London-based. Photo 3. Photo 4. Simon Davies suggested the Savoy Chapel in central London. In more recent years, he explains, the churchyard has had its gravestones removed and been landscaped. 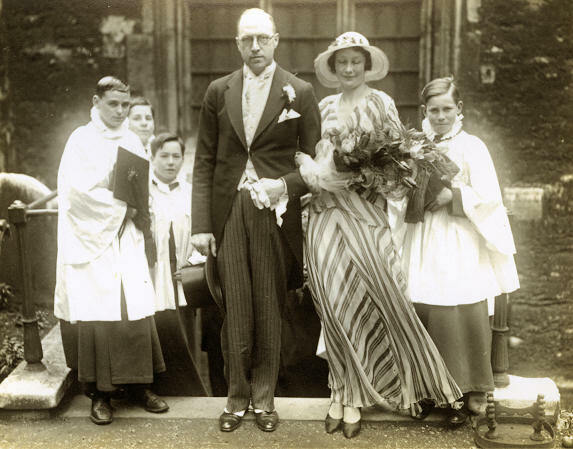 However, upon enquiring with the appropriate archive, Simon has been told that there were no weddings with those names and on those dates at the Savoy Chapel. Peter Ord from British Columbia has asked for help in identifying the location where a family wedding photograph was taken. Peter says that his wife's family were from the Midlands. My guess would be that the photo was taken further east, as the walls appear to be of flintwork. In any event, the armorials around the door are distinctive, and should help. David Jones is trying to identify a Primitive Methodist Chapel. Above the door is a date, perhaps 1856. 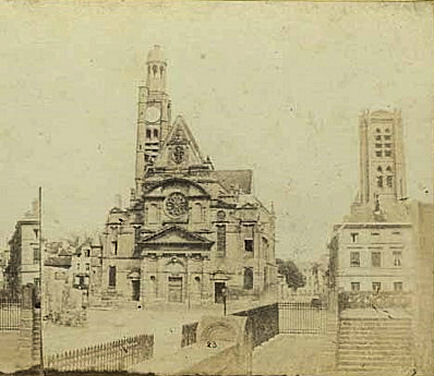 A drawing of a church from 1882. Believed to be in the Stamford area, can you give Martin Dean an identification? 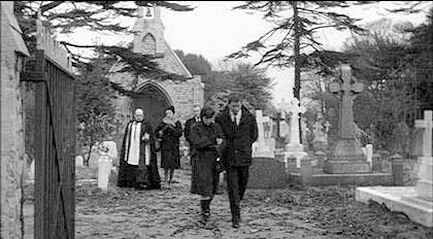 An usual query this time - Greg Mishevski is interested in the location for a scene in the film "Girl in the Headlines" (1963), which shows a cemetery chapel. He's provided two stills - 1, 2. Also from Greg, the still "sec002" here is from the film Secret Ceremony (1968). An identified church from the same film is on still "sec007/a/b" here, and is St. Mary Magdalene in Paddington, but doesn't appear to be the same church. Sec002 also has some resemblance to Victorian breweries or other industrial buildings, so it may just be a background building rather than a church. Certainly a church is still "sta002" here, from the film Staircase (1969). Greg thinks it could possibly be in the Wimbledon area. Can you identify either location? Jens Petter Kvande in Sweden has a painting dated 1880, and attributed to James Hamilton, R.S.A. This is probably James Whitelaw Hamilton, R.S.A., who lived in Helensburgh. The painting reminds me of the Romney Marshes. Although it doesn't show the church in any detail, it is evidently a large church, and there may be another smaller one to the right. Can you identify the location? Simon Davies has made a strong case for it being the Abbaye de Cerisy la Foret in Normandy, France. Wikipedia entry here. Dave Godden suggests that the main church is St. Mary in Rye, with the smaller church to the right possibly the Church of the Holy Spirit at Rye Harbour. 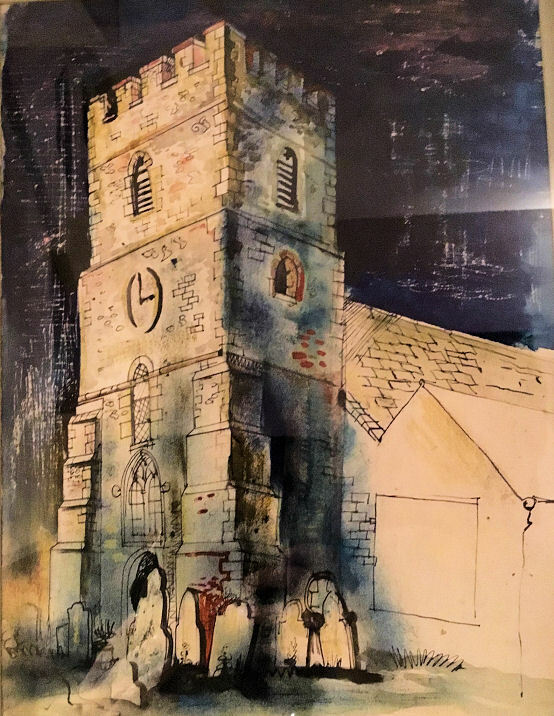 However, I've also received counter-arguments from Simon Davies, who says (among other things) that the west tower of Rye church conflicts with the central tower in the painting, and also that Rye is at the bottom of hill, not evident in the painting. What do you think? Another postcard from Judy Flynn's collection. 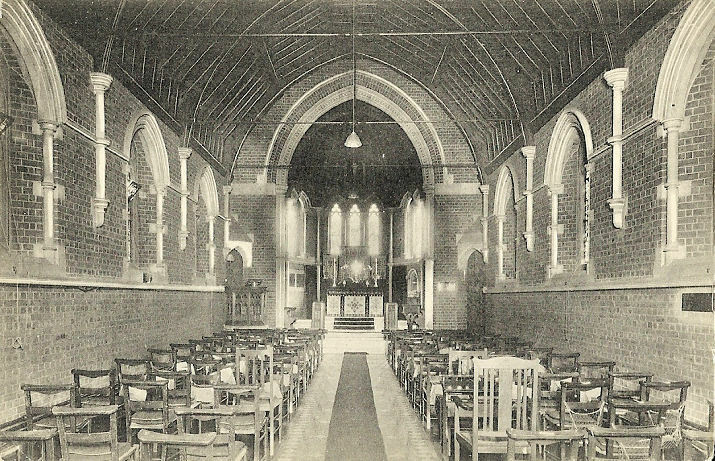 St. Alban at Sunningdale is possibly the demolished one mentioned here (just beneath the church photo), but positive proof would be welcome. The postcard was posted in 1905. 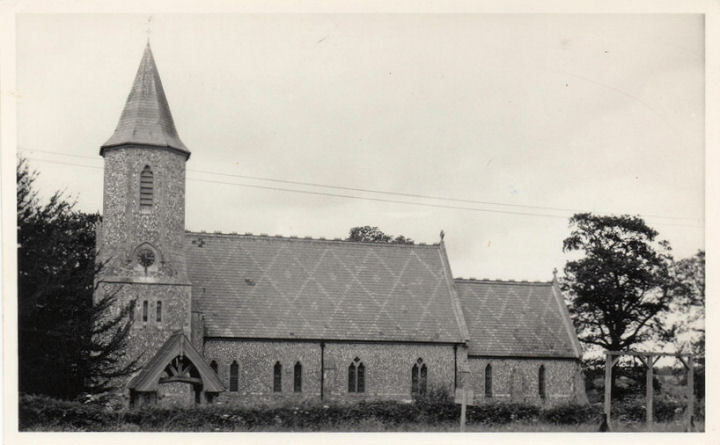 Howard Richter advises that the footprint of the church in the postcard is not contradicted by map evidence, and the grid reference would have been SU 943 660. It appears to have been built between 1900 (not on a map of that year), and before 1915. Another old postcard shown here (scroll down) is again entirely consistent with this being the Sunningdale St. Alban's. It also says that it was a daughter church to Windlesham (St. John the Baptist). Q.E.D. Now, a couple from my own (Steve Bulman's) Collection. First a rather grand interior, decked out for Christmas celebrations. Next, another interior, very plain in contrast to the last one. 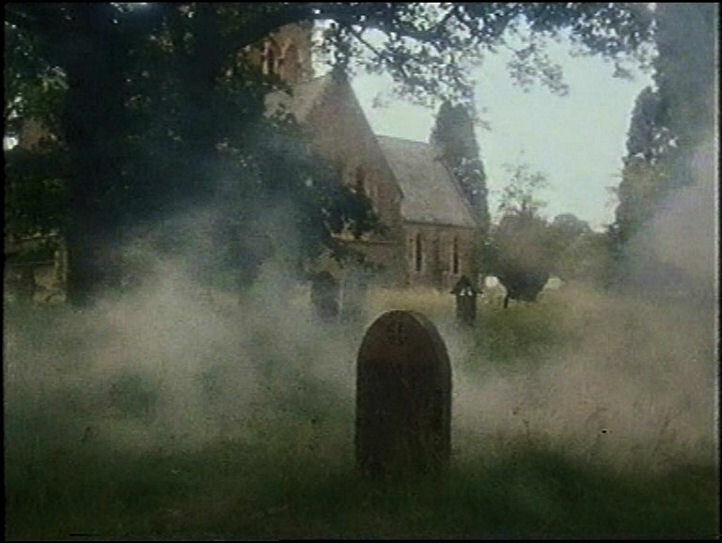 We've had some success identifying churches used in films - here's another. 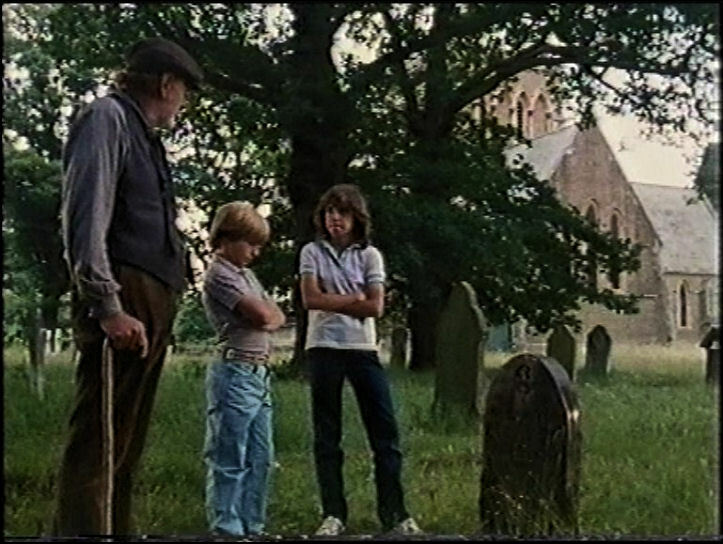 Ian Stapleton has sent in two frames (1, 2) from Haunters of the Deep (1984). It was filmed mostly in Cornwall, with village scenes in Portloe, but the church isn't the one in Portloe (shown here on Geograph). 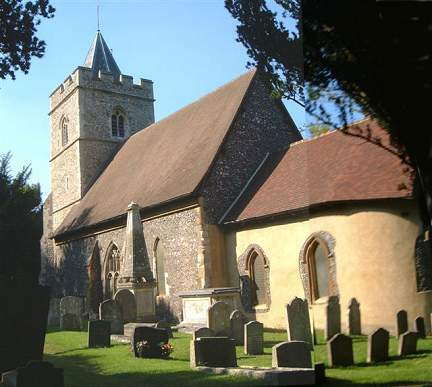 Greg Mishevski has suggested Holy Trinity, Botleys and Lyne, Surrey. There is certainly nothing that contradicts this in the following photographs on Geograph (1, 2), and the Google Earth view from the road (search for botleys holy trinity) is supportive, even as far as the types and positions of trees. 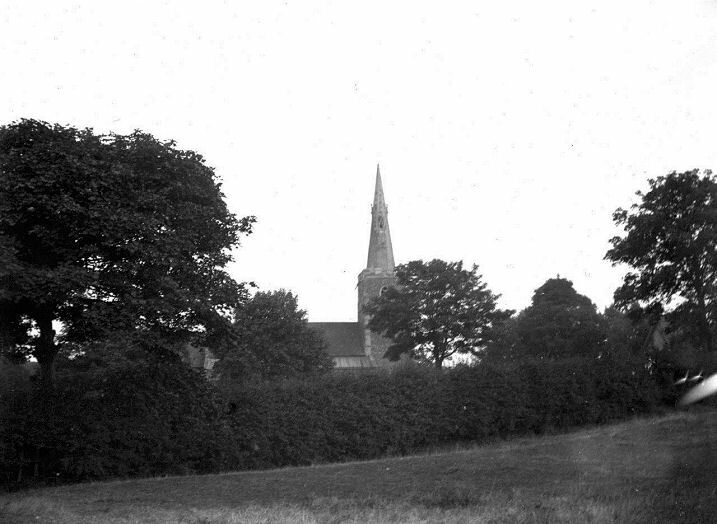 However, the film still was evidently taken from the rear of the church, and myself and others have been unable to find a photo on-line taken from that direction. If you can find a photo, or even better, visit the church and take one - definitive proof would be excellent. Dave Godden recommends Bing birds-eye view for looking at the church. Two more from Judy Flynn. 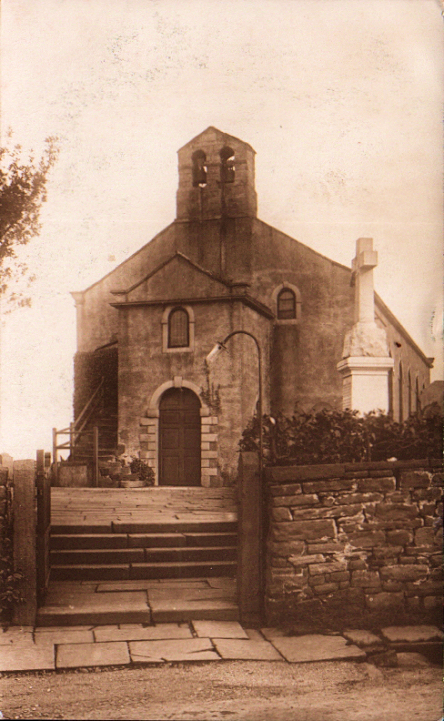 Written on the back of the first is "Emley, near Huddersfield, West Yorkshire", but it isn't the parish church, so what is it? Greg Mishevski has tentatively suggested the demolished Emley Bethel Wesleyan Reform Union Church on Upper Lane, which is shown on old maps. 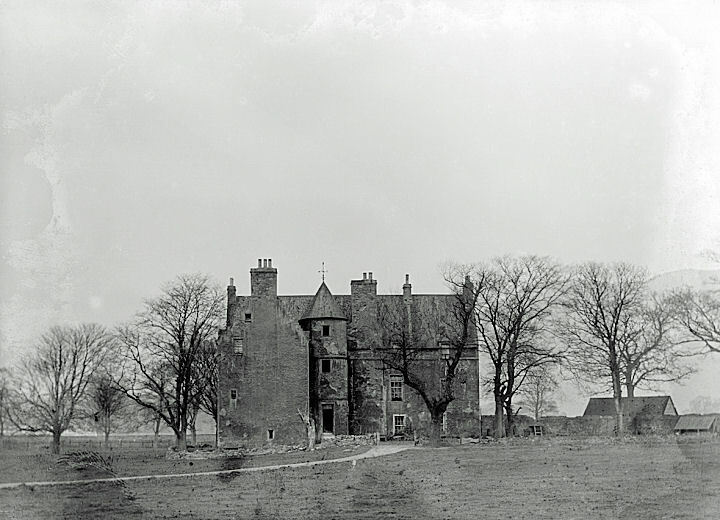 Built 1854, closed 1995 and demolished 1997, these two links (1, 2) refer to it, but don't include photos. Can you confirm or refute the suggestion? 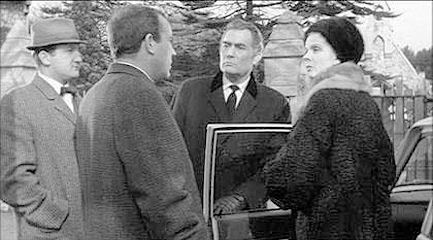 Both Janet Gimber and Brian Curtis have managed to find photos which imply that it isn't the Bethel Chapel. See the following - link1, link2, link3 (click "Go to resource"). David Regan doubts that the church is at Emley at all, as he knows the area; he also points out that the houses at the extreme left appear to be of three stories, and there has never been anything like this in Emley - perhaps it's time to cast the net wider! The next has some confusing hand-written text on the back - "St. Andrews Church, Belfast", and "This is St. Andrew's Church" then "Stafford". Perhaps Stafford is the sender - it was posted in 1916. 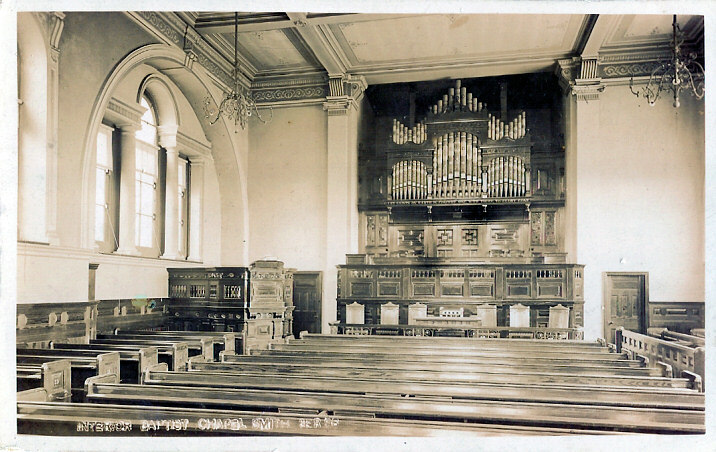 A neat piece of detective work by Brian Curtis suggests that it may indeed be St. Andrew, Belfast - the website of the church of St. Hilda, Kilmakee, Dunmurray has the following; "The organ was a gift from St. Andrew's, Belfast, which closed in 1970....", and a photo which includes the organ. Although the organ is not seen well in Judy's postcard, there are strong similarities. Brian has also found an old photo of St. Andrew (here), though it doesn't help in solving the puzzle. John Bowdler is looking for locations for a font. It is rather plain, and will probably be difficult. Another interior from Judy Flynn. Hand-written on the back is "Thornton Heath", and the postcard was also published there. 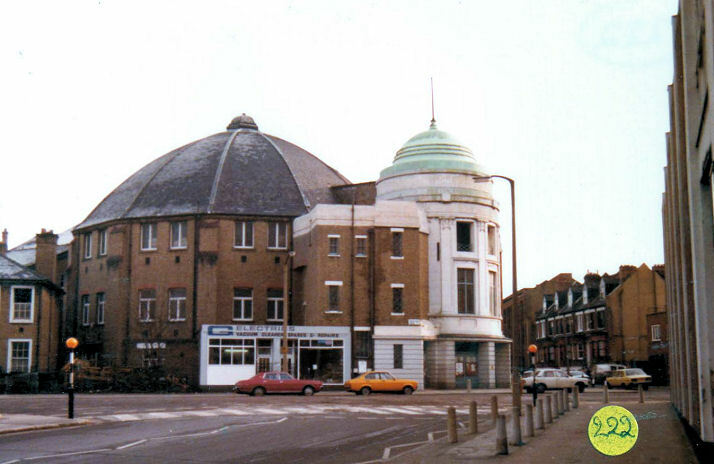 Judy has found one church in Thornton Heath with an apse (St. Paul), but says it looks very different. Is this the right church, subsequently altered, or is it a different one? 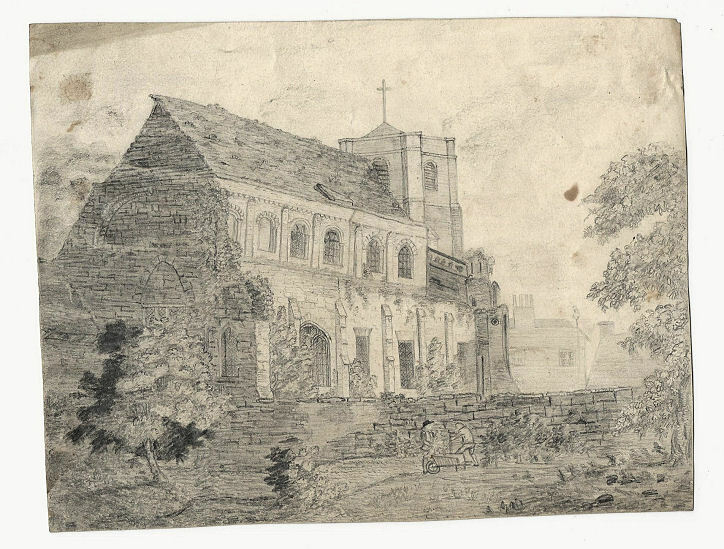 Howard Richter speculates that this could be the predecessor of the present Christ Church, on Sumner Road, at TQ 317 665. Visible on Google Earth, the present building incorporates part of the original 1852 building (at the left), and which now serves as the church hall. 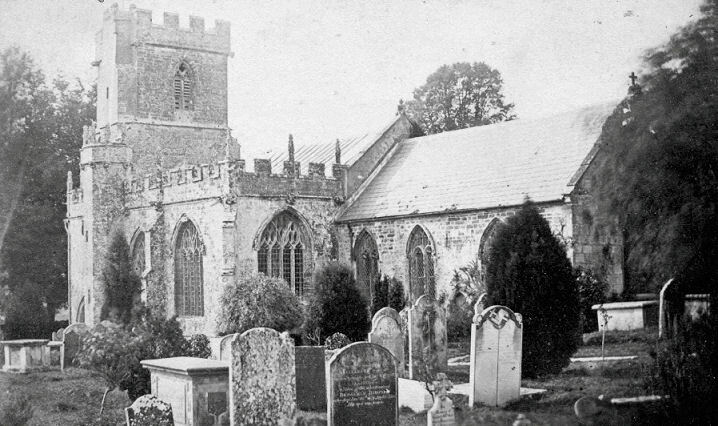 The church website gives some history, including the fact that the parts of the old church were only demolished in the later 1980's. Howard has also pointed out another possibility, this being a 19th century Congregational Church which stood on Campbell Road at TQ 316 670. 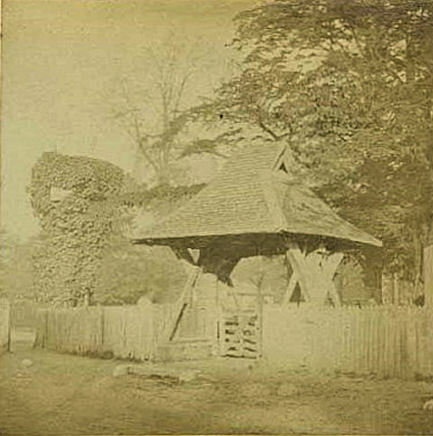 It had been demolished no later than 1896. Another two fonts from John Bowdler. 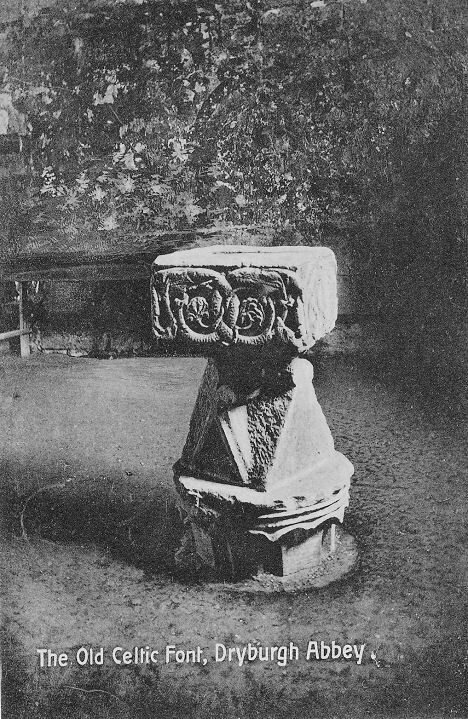 The first is clearly labelled as "The Old Celtic Font, Dryburgh Abbey", but John has searched for modern photos showing the font in situ, without success. So has the font been moved somewhere else? The second offers no clues. [Now solved, see Bosham, below]. 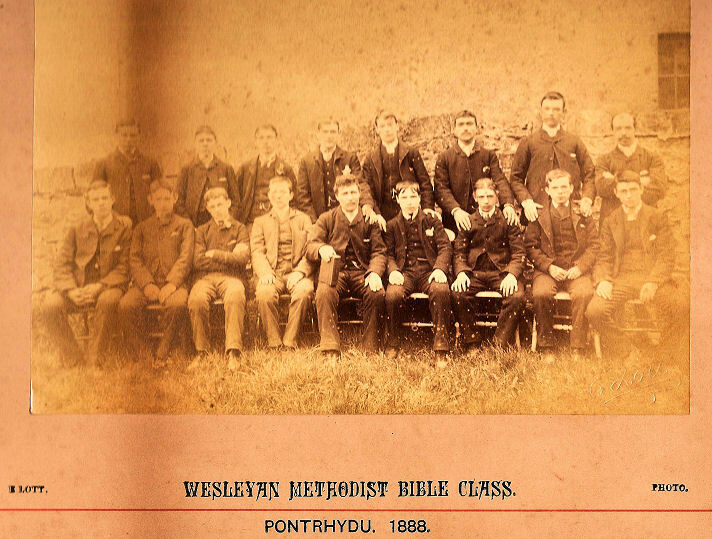 Jonathan Gould has found an old photo of a group of young men, with the caption "Wesleyan Methodist Bible Class, Pontrhydu, 1888". The mystery is that neither he nor I can find any mention of a Pontrhydu on the internet. The photographer was Edwin Lott, of Nolton Studio, Bridgend, so that may serve as a clue. 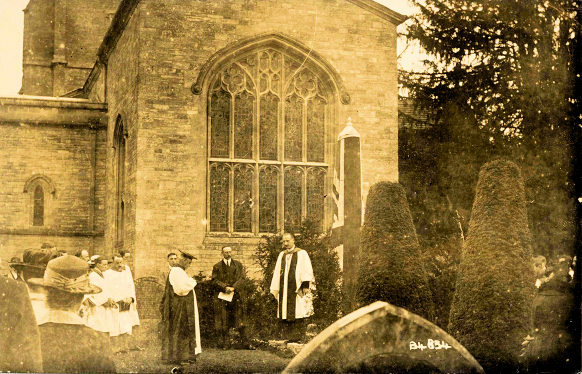 Can you advise where this church is or was? This one has generated a lot of discussion, which I will distil as follows - Simon Davies has offered Babell Welsh Wesleyan Methodist Chapel on Llan Road, LLangynwyd, where the main population centre is Pont Rhyd-y-cyff. He suggests that a local shortening of this to Pontrhydu would be entirely consistent with linguistic habits in Welsh. Mike Berrell has suggested Pont Rhyd-Ddu in Gwynedd, where a place of worship is shown here on Streetmap, though not on the OS map. 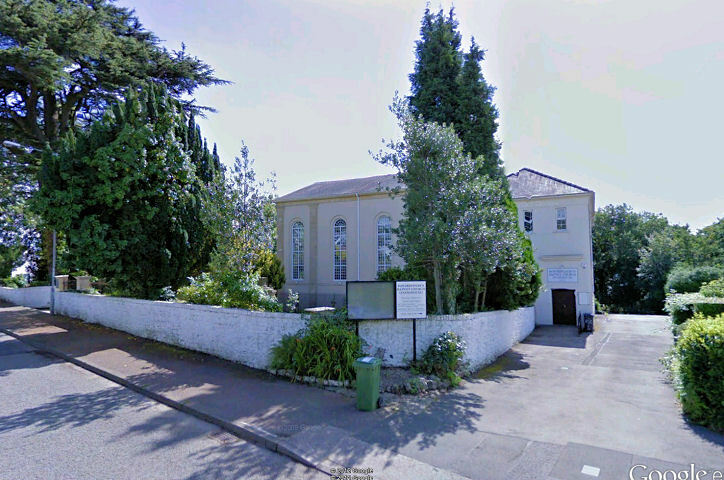 Chris Willis has advised that this is Rhyd-Ddu Methodist Chapel which shows on the 1889 OS map as Methodist Chapel (Calvinistic), and that it does show on the current internet OS map, but only the ZoomMap version (where it is indicated by PW), but not on the Leisure map. Unfortunately, I cant see enough on GoogleEarth to decide whether the mystery photo is from here. "The Wesleyans. 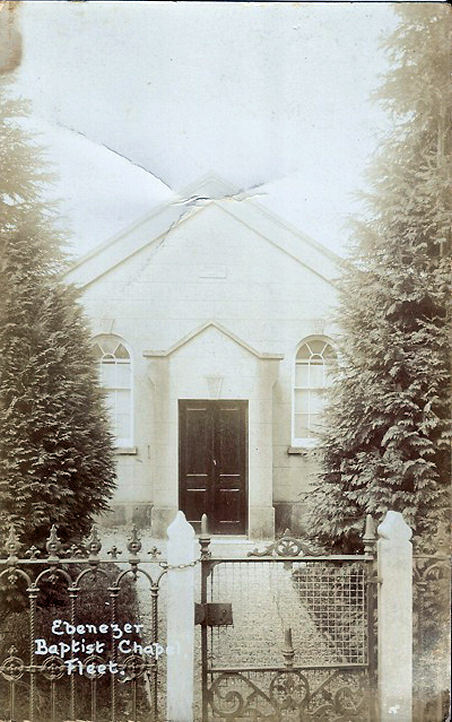 The first start in connection with this denomination of Christians in the Parish was in a cottage in McGregor Row, in the year 1839. 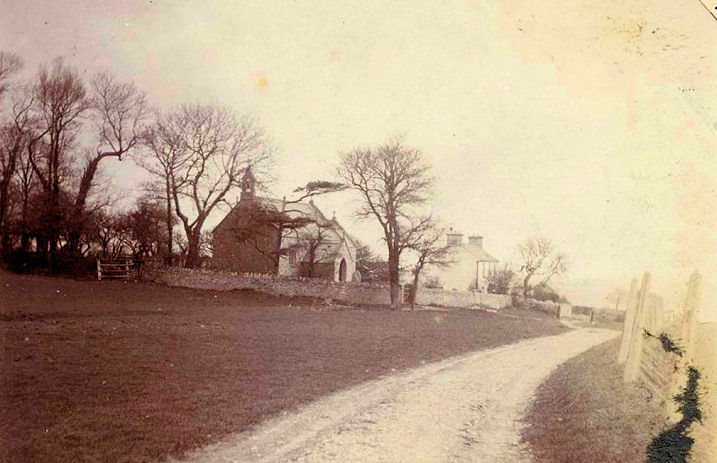 Services were held in this cottage for about two years, and conducted by local preachers, and occasionally by an ordained minister from Cardiff, in which circuit Maesteg was at that period. When the number of members reached ten, an effort was made to acquire a place for worship; and at a circuit meeting held at Llantwit, the matter was considered, but disallowed, as being contrary to the rules of the Wesleyan Conference. 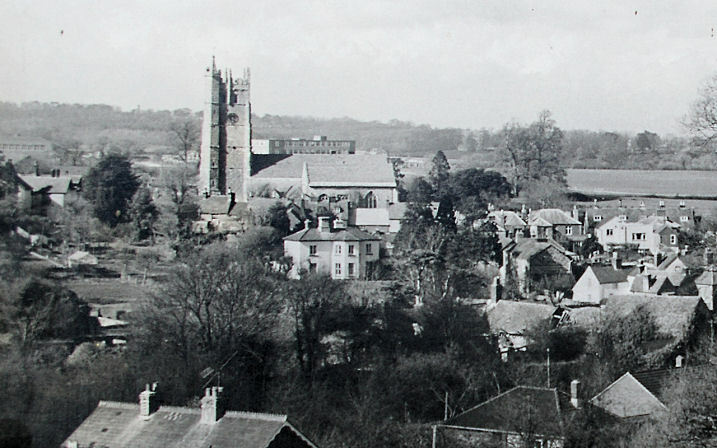 Subsequently, Bridgend and Cowbridge, with the surrounding villages, were constituted into a separate circuit, apart from that of Cardiff, and the little church at Maesteg was attended to by the ministers residing at Bridgend and Cowbridge, and the services held at the old Welsh Calvinistic Methodist Chapel, now the residence of the Rev. John Jones. 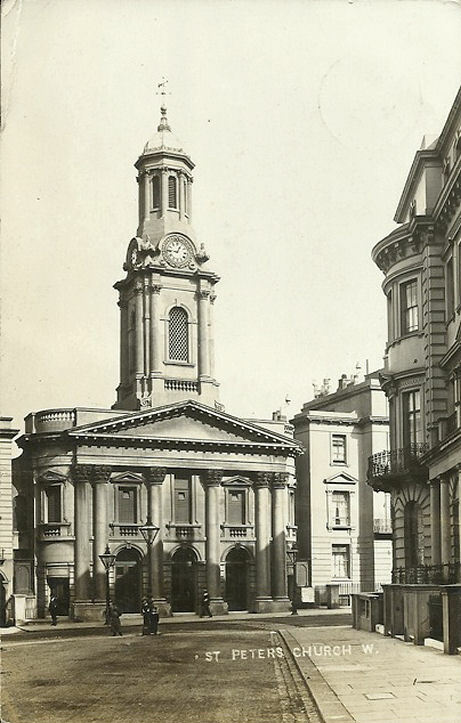 For some reason the services were again discontinued in the Welsh Chapel, and the small band of worshippers held their meetings for some time at the old English Baptist Chapel, Galltcwm Row; in Shoemaker Row; in the Swan Club-room; and in the Old Works Infant Schoolroom. 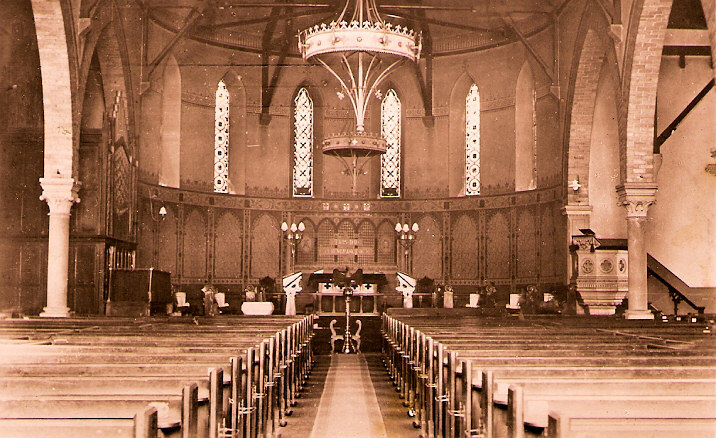 After these years of wandering, in the year 1857, the friends resolved upon building a small chapel. 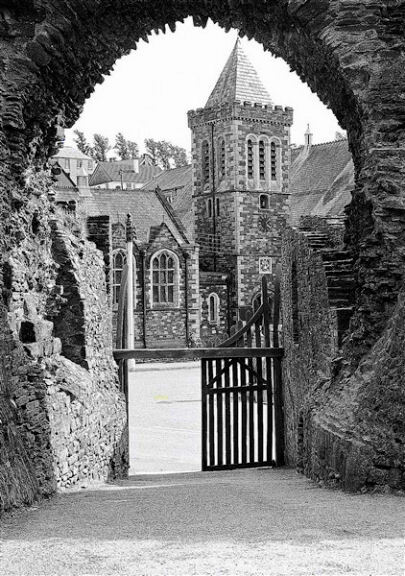 The plans and scheme were approved of at a quarterly meeting of the circuit at Bridgend, the Rev. Thomas Osborne (afterwards I. Osborne) presiding." So Babell remains a possibility. Janet also offers the one-time Independent Welsh Chapel (later named as Bethesda) in LLangynwyd. Currently for sale, the Estate Agents description and a photo are here. A screen capture from Streetview shows a wall which bears some resemblance to that in the mystery photo. 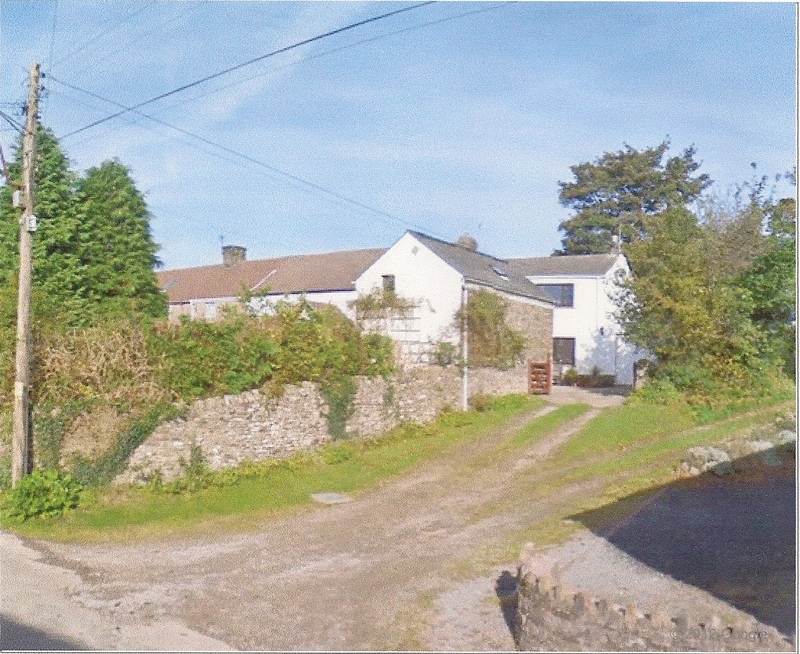 Colin Waters suggests Pontrhydyrun, which has a Baptist church, and again, the boundary wall is similar. Compare again with a screen capture from GoogleEarth. It would be useful to learn some history of this building to confirm or refute the suggestion. See also the Wesleyan Methodist entry for Maesteg, which may be relevant. Another from Brian Curtis's collection - this is of a church apparently standing in isolation at the end of a track. 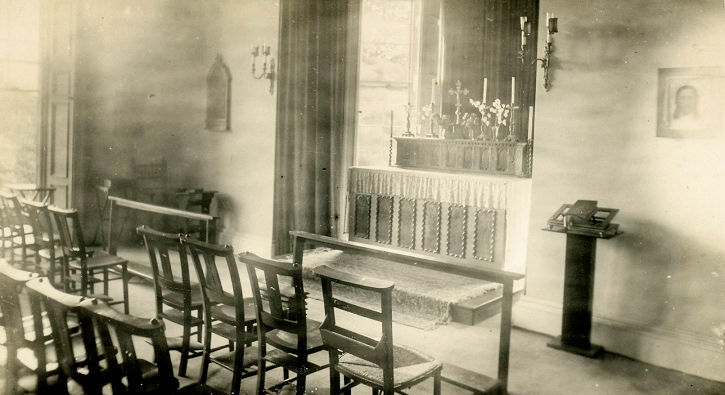 Another from Judy Flynn's collection - a Baptist Chapel interior. The text isn't terribly clear, so I've also made a blow-up of it. Leslie is trying to identify a church with family associations. 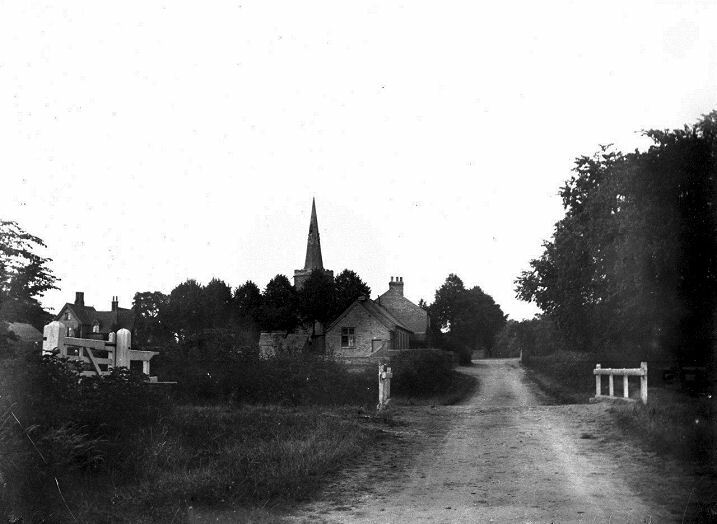 The family lived near Duckington in Cheshire from about 1873-82, and in Eccleshall, Staffordshire until about 1890. 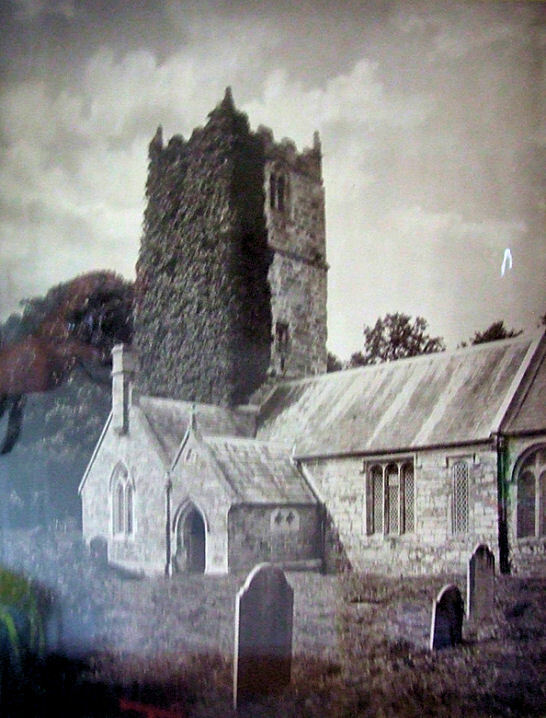 A family baptism took place in Holy Trinity at Bickerton in Cheshire, and although the present church there bears some resemblance to the mystery church, there are sufficient differences to make the identification uncertain. However, the listed building entry (Grade II) does mention some changes to the building which make further consideration useful. Can you supply an old image of the church? 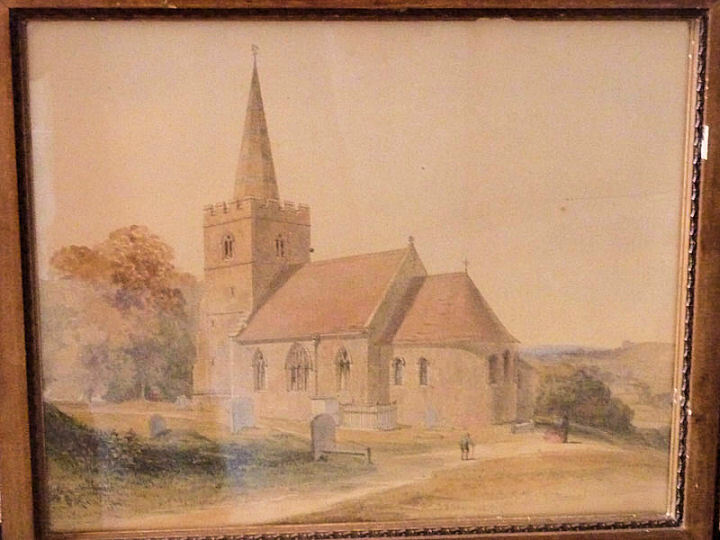 Henry Tribe is trying to place a church in an old watercolour. The combination of apse and prominent tombs should (if this is a realistic painting) make identification easier than some. Can you oblige him? 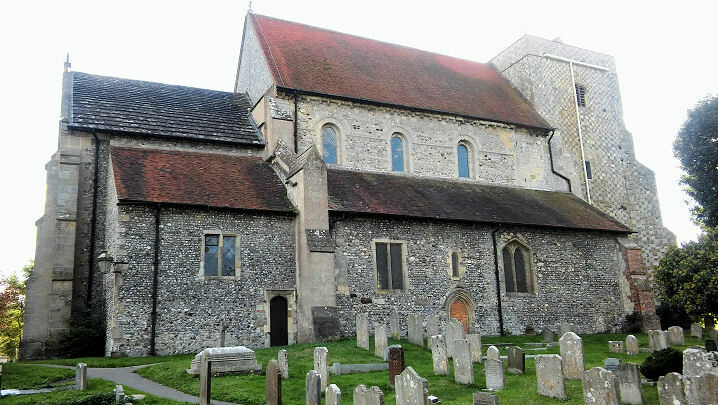 John R. Parker has advised that the church bears many similarities (and some differences) to St. John the Baptist at Great Amwell in Hertfordshire. There is a photo on this website taken from a roughly similar position - see here for comparison. Are you familiar with the buildings restoration history? Or could artistic licence account for the differences? An old oil painting next, with an admittedly partial view of a church. 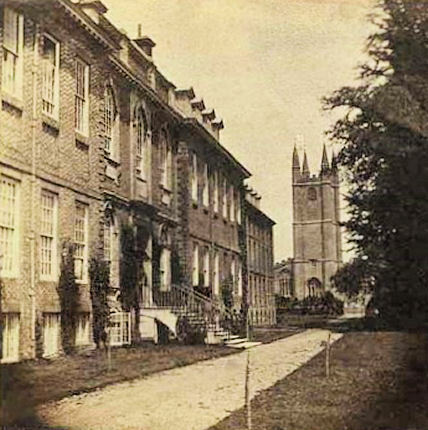 In Marilyn Coetzee's family for over a century, it is presumed to have a link with one of her ancestors, who lived at Gringley-on-the-Hill (Notts. ), Lincoln, Ashbourne (Derbyshire), Snelston (near Ashbourne), and Southwark (now Greater London). Another view. David Regan advises that he is reasonably certain that the painting is NOT in the Gringley area, which he has been exploring recently. He cannot rule out the Isle of Axholme a little further north, however. 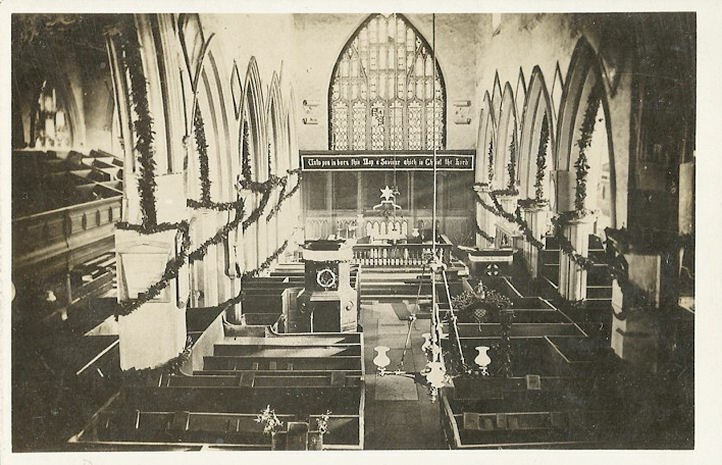 Another old postcard of a church interior, from Judy Flynn's collection. The only clue is the text on the front of the card - "C. A. C. Stoke". 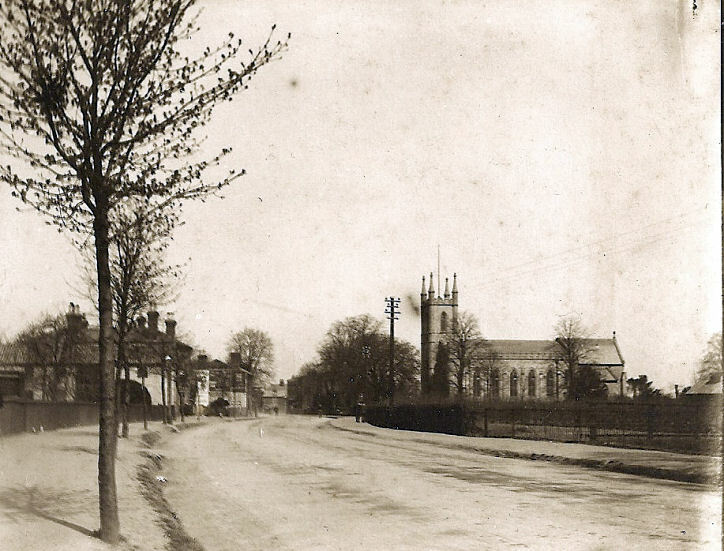 Brian Curtis has tentatively suggested that C. A. C. may stand for Catholic Apostolic Church, and his researches have shown that there were two in the Fenton area of Stoke. The first was built in 1879 on the corner of Bowstead Street and Church Street. 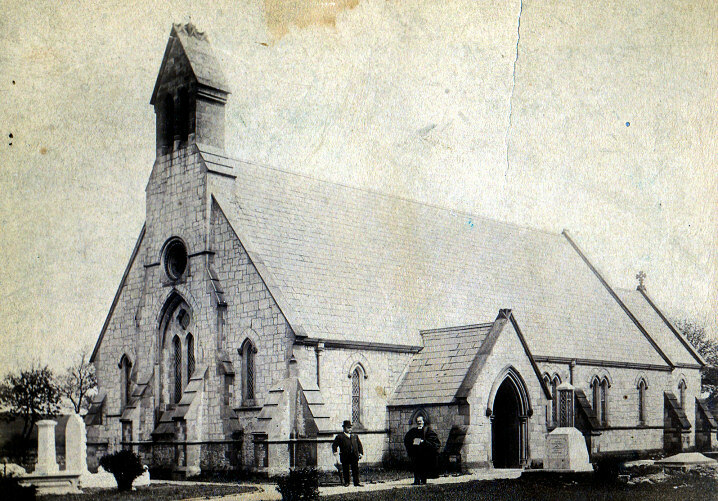 This was replaced by a new church in 1896 on the corner Whieldon Road and City Road. The first church was later used as a Gospel Hall. From old map evidence, both were still extant in 1937, but the whole area was redeveloped at some point, and neither building remains. 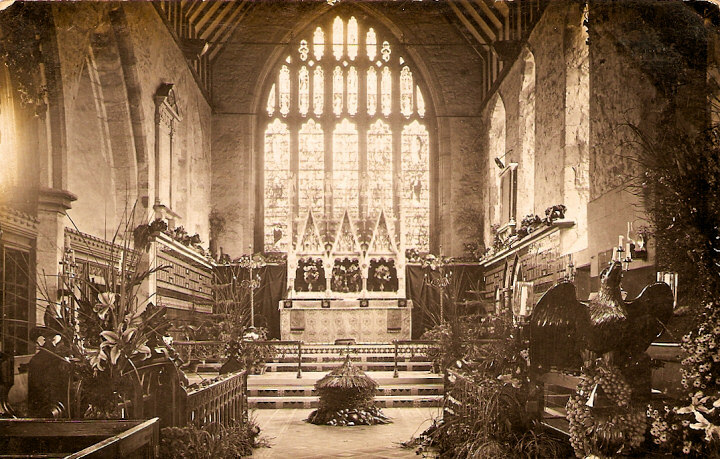 Neither he or I have been able to find any photos of either church (interior or exterior), so the suggestion must remain unproved for the moment. A few postcards from Brian Curtis now. The first is of an interior, posted in 1967 in Chiswick. Hand-written on the back is "Trinity 1967", not in the same hand as that of the person who sent it. 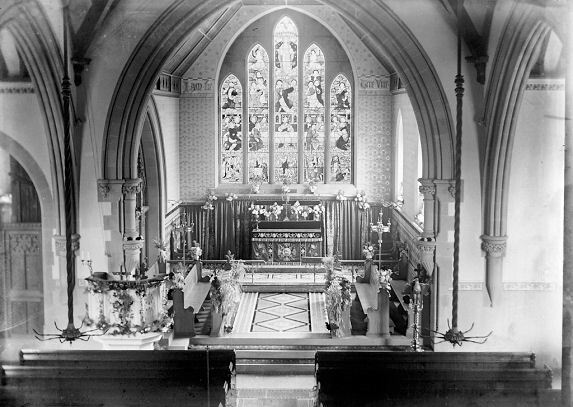 As an afterthought, Brian has suggested that it might be a school chapel, on the basis that Trinity might refer to Trinity Term. 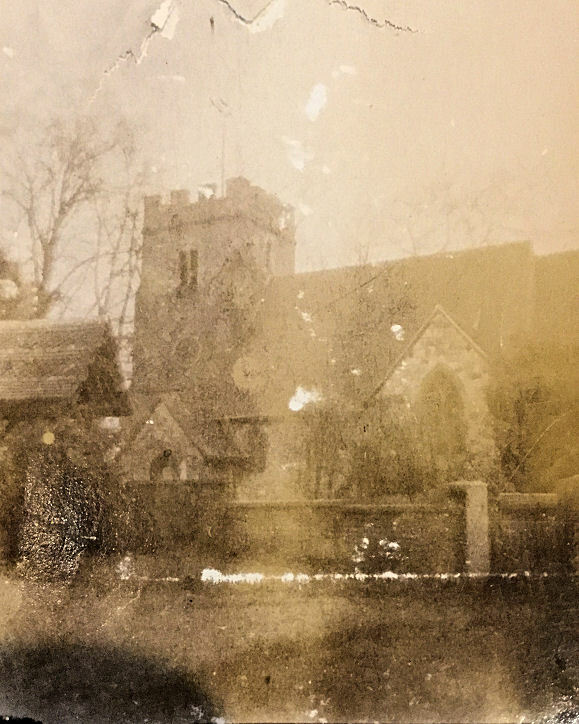 Alistair Moffatt has an old photo of a church, probably in England, which he suspects probably dates from 1890-1910. A couple of interiors from Steve Bulman's Collection now. 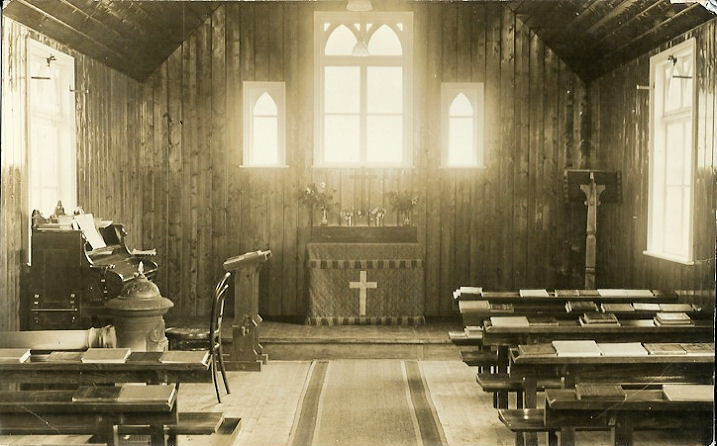 The first was evidently taken at Christmastime, the second is a very plain chapel; neither offer any clues whatsoever. Alan Regin has asked for help in identifying two, or possibly three churches. 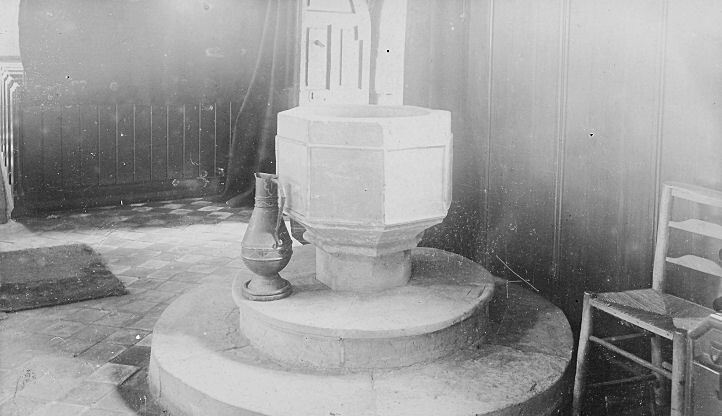 Taken by Charles Cole, a bell-ringer, who died in the 1940's. 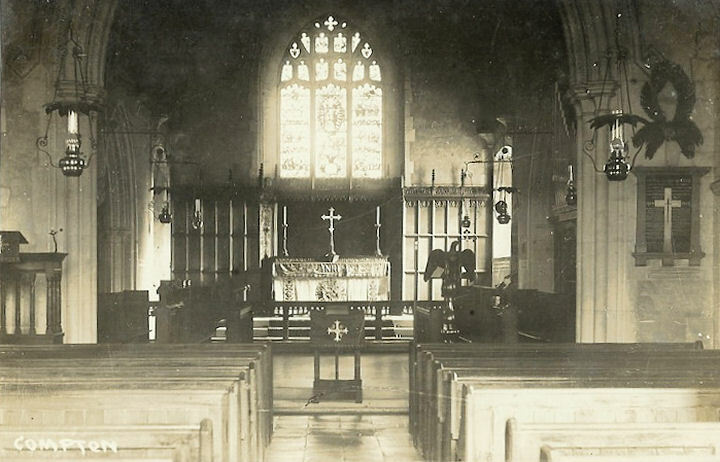 There are nearly three hundred church images, but only these remain unidentified, which Alan believes were taken circa 1912. The identified churches have a wide geographical scatter, but mostly from the southern half of England. 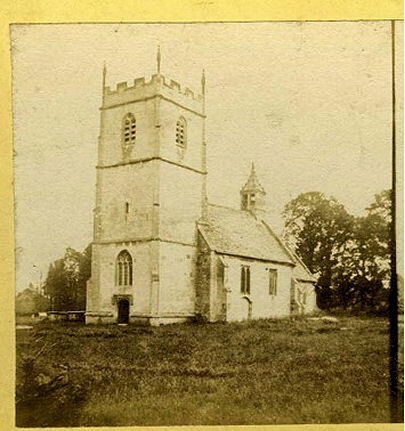 What is possibly one church is shown on two photos - 1, 2, though neither shows the building very well. It reminds me of churches in Northamptonshire or Oxfordshire. The other is shown very well, and seems to have flint walls, so S.E. England perhaps? Some more postcards from Judy Flynn. This interior is labelled as Compton. There are many Compton's scattered around the county; Judy is fairly sure that this isn't the one in Surrey. [Now solved - see Compton, below]. 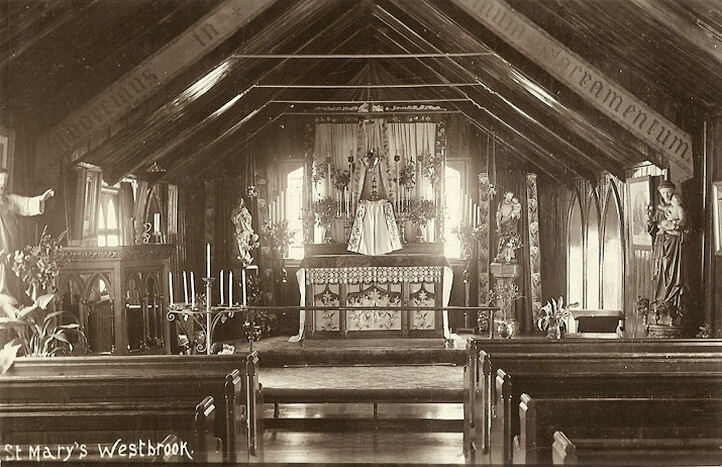 Next, the interior of what seems to be a wooden church, which was posted in 1902 from Church Stretton in Shropshire. If indeed wooden, then the church may possibly no longer exist. Another old postcard from Mike Jones, this one offers no clues. It is rather distinctive however. The curious structure atop the tower looks wooden, and may possibly no longer be there. An old postcard interior from Judy Flynn's collection. Having discounted the Suffolk and Yorkshire Hepworth's, Judy suggested that Hepworth might have been the publisher instead, leaving Church Kirk as the only clue. 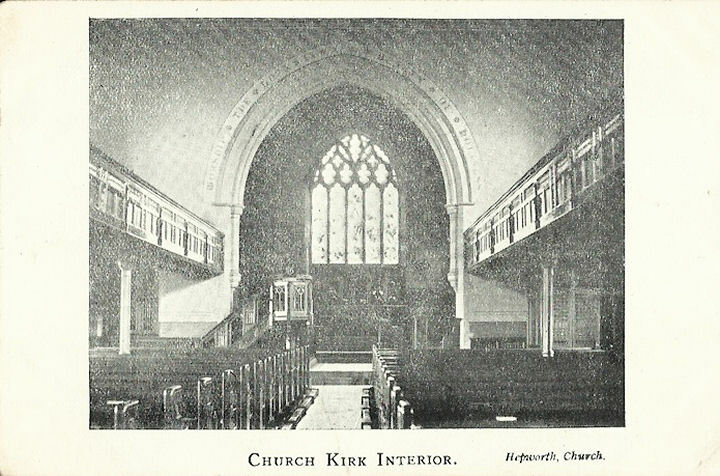 I managed to discover that Church Kirk was an alternative name for the location of St. James at Hyndburn (now a suburb of Accrington) in Lancashire, however I can't find any interior photos. The description here is at least consistent. Can you confirm or refute my suggestion? Janet Gimber has confirmed my suggestion, and pointed me to the Grade II* listing, which includes a photo of the East window. 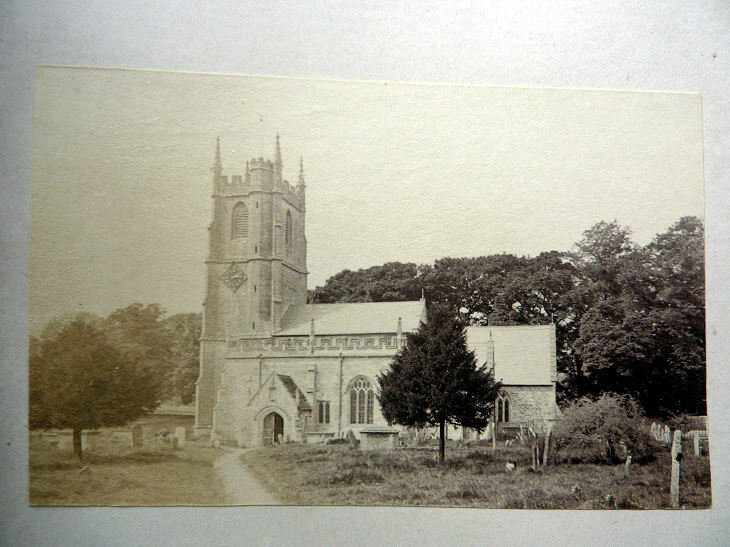 Mike Chester has also advised of the Wikipedia entry, which, although lacking a photo of the interior, has a description of it, again consistent with the postcard. 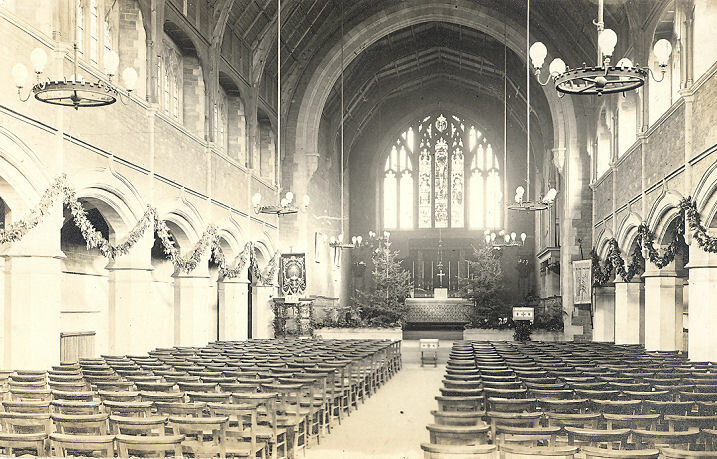 Mike also advised that the church is currently (2018) for sale, and the estate agents notice includes some interior photos, providing a final confirmation of the postcards identity. 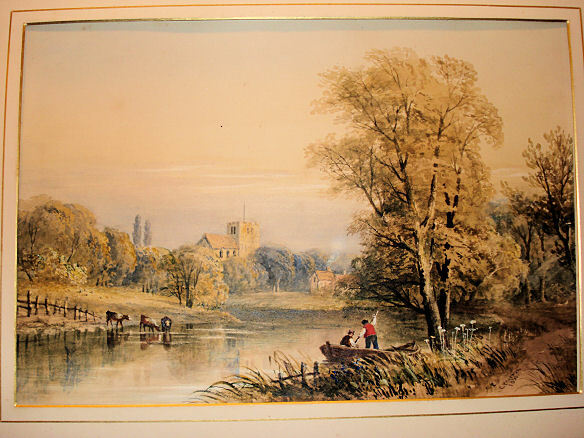 Kate Burhouse recently came into possession of a watercolour, showing a river or canal scene. There is a church (or possibly a castle) in the distance. Can you identify the location? 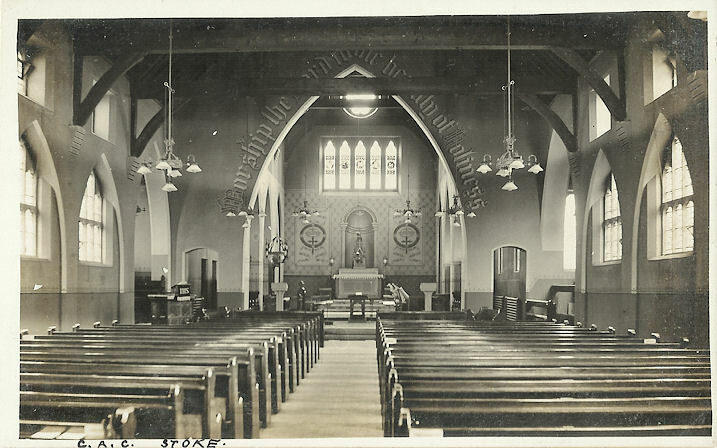 Another of Judy Flynn's postcards - an interior labelled St. Mary's, Westbrook, which has a catholic feel. On the rear in pencil is Berks, near Newbury. An old OS map of the 1985 vintage show a chapel at Westbrook near Boxford in Berkshire, presumably now closed. Circa SU 426 716. Can you confirm whether the interior and the chapel on the map are of the same building, and supply a little history? 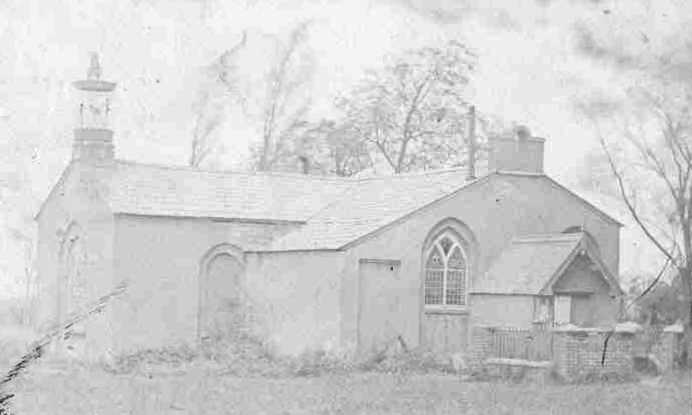 Brian Curtis has been in touch to say that he has consulted a number of old OS maps, and all show this chapel as Methodist, which the Victoria County History confirms (see here). He agrees that the postcard shows a catholic chapel (or at ant rate, NOT Methodist). He has also provided a link to show the building on Google Earth here, evidently converted to residential use. So, not Westbrook, Berkshire. There is also a Westbrook in Kent, and there may well be more. 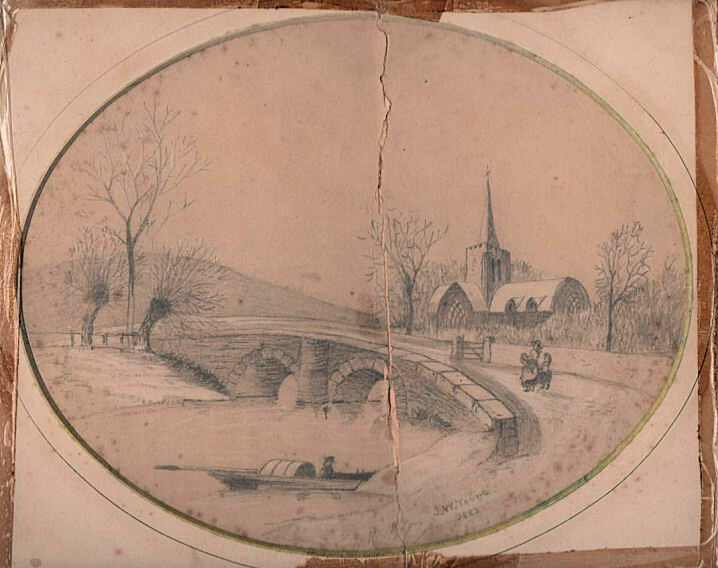 Mindy Wright has a family painting of a church, dated 1834. If the church still exists, it should be easily recognizable, as its position by a pond or river, and its tower, are distinctive. A family wedding photo from Tina Snuggs. Tina is keen to find out the location of the church as it may help to name the people getting married. 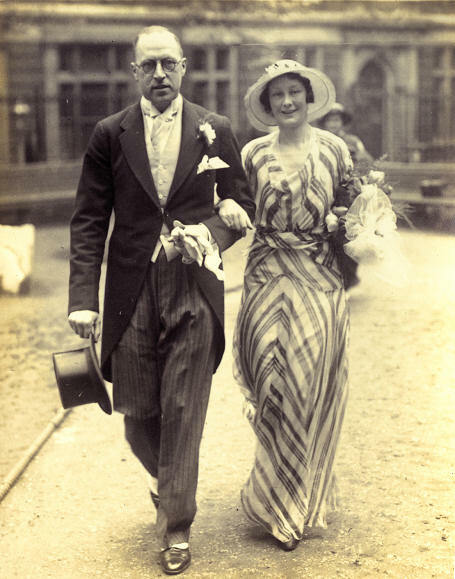 The family mostly lived in Chelsea and Wandsworth at the time, though of course it may be elsewhere. Based on the model of the Rolls Royce, Tina dates the photo to 1907 or later. A similar request has come in from Mark Wilson, who discovered a photo album in a skip in Dagenham. Most of the photos are of a wedding, and identifying the church may help find the family. The church interior has a seven-light East window with rose window above. The rather awkward transition from the rose to the junction of the 2nd and 3rd, and 5th and 6th lancets are unusual, and may help with identification. The rest of the album can be viewed here, and includes photos including the iron-strapworked door, the only exterior views. Photos are on an external website. 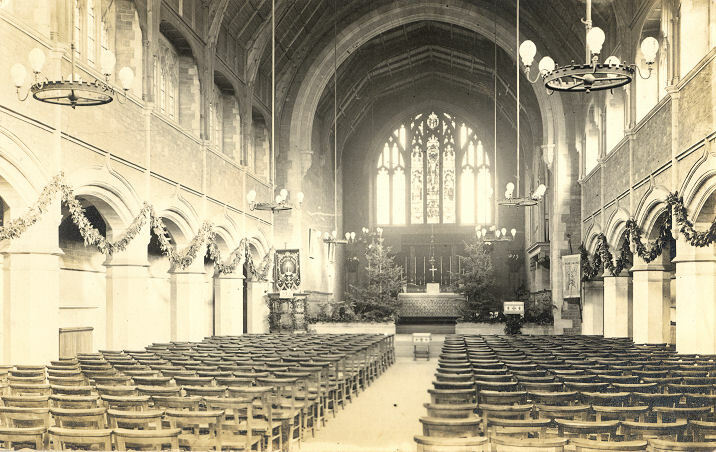 Now solved, this is the demolished St. Margaret at Plumstead. It was solved by Graham Maxwell, and this link provides the proof. Two old photos now, showing an exterior and interior. The latter is dated 1893. Both from Christopher Skottowe's Collection. 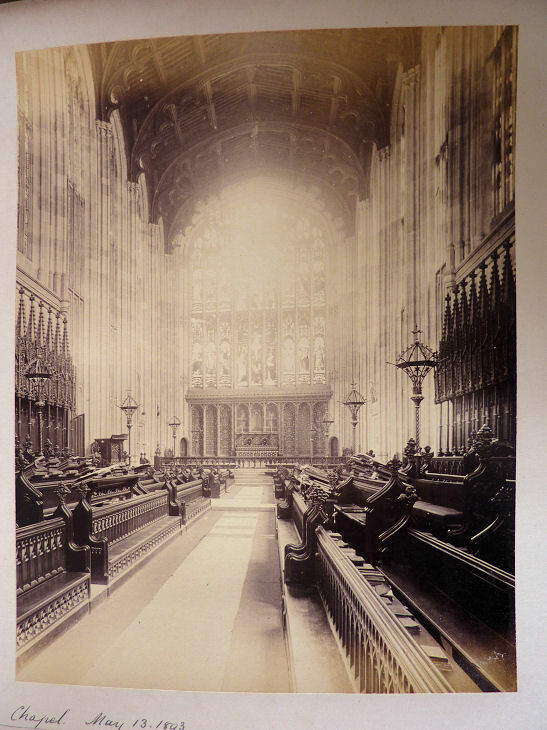 [Exterior is St. James, Avebury, and the interior is of Eton College Chapel, Windsor]. Another old postcard from Judy Flynn. 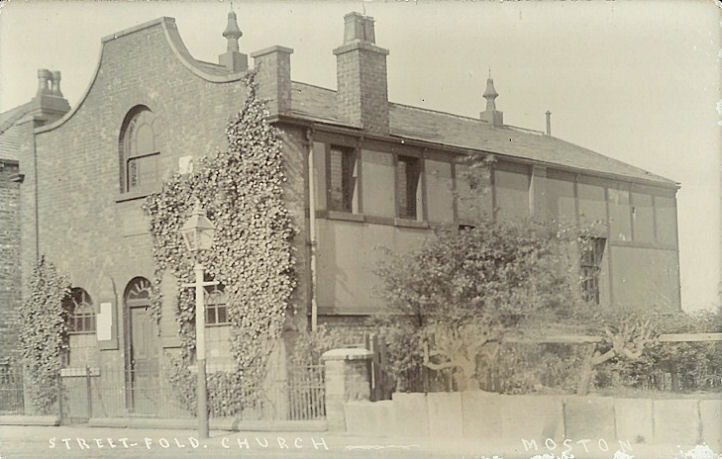 Labelled as Street-Fold Church, Moston, which probably places it in Greater Manchester. [Now solved, update to follow]. 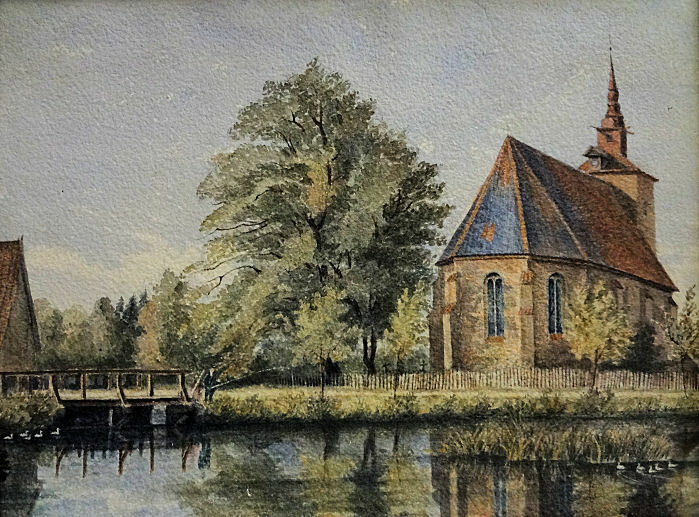 Jacob Boston is keen to find the location of a church in a painting. At first glance it has few obviously useful features, though the clasping buttresses will help. Three more from Jan Bradley's old stereoview slides. 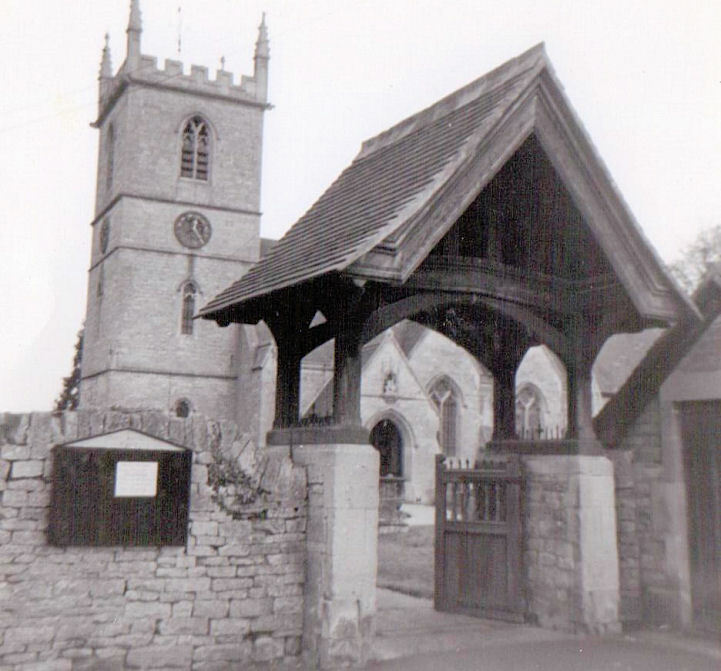 The first if of a rather fine lych-gate; next a church, which as Jan says, may not even be British [now solved, see Paris, below], and the third has the look of the West country to me [now solved, see Marlborough, below]. 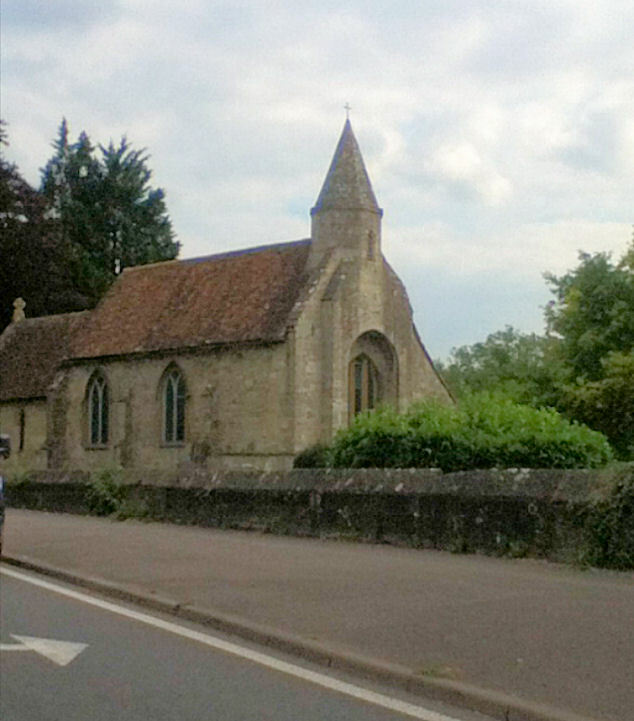 Brian Curtis has proposed St. Margaret's at Hooley in Surrey as a candidate for the lych-gate. Certainly a modern Streetview is supportive of the identification. Toby Lott is trying to identify the location of a church in a painting (large pdf file) by John Constable. Titled "On the River Stour", it's known to have been painted in the first two decades of the 19th century, and during this period Constable is known to have been painting in Suffolk, Kent, Dorset, Warwickshire, and in the Lake District. It is possibly a commission by the Rev. Thomas Fisher or Samuel Peach. The rivers name is of little help as there are several in England, and I've been able to find Stour's in all of the possible counties, except for the Lake District. The church itself, if painted accurately, has (or had) a circular stairway ending above the level of the top of the tower. Can you provide Toby with a location for this painting? Peter Langmaid is trying to identify the location of a church. 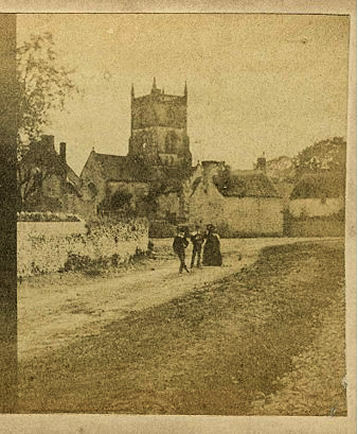 In the original image, "Church Street" can be seen on the building at the right. The large-flat-topped tower should be diagnostic, so where is it? [Now solved, see St. Helier, below]. 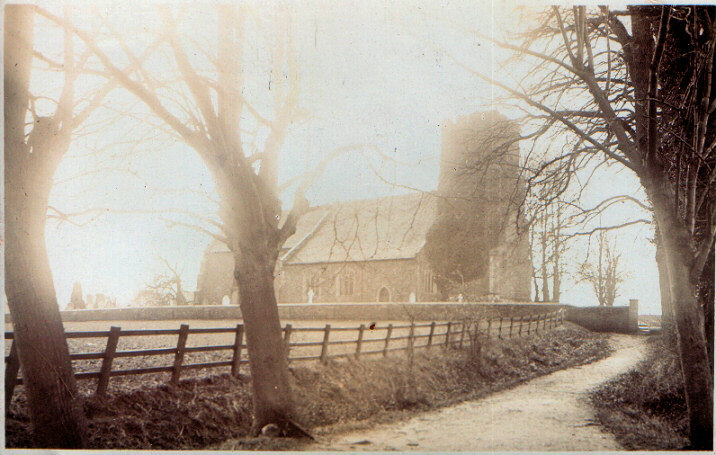 An old photo now of a church, possibly in Kent. Can you identify it for Geoffrey Tucker? Andrew Woodyatt has an interest in old cinema's. Here is a photo is one such, and he believes that it may have been a Methodist building of some sort, but he doesn't know where the building is (or was). Can you advise? A lovely old photo of a church beside a river or canal, with a lift bridge. The bridge may have gone, as indeed may have the canal if such it is, but can you identify the location for Ken Partridge? [Now solved, update to follow]. Avril Hodgkins has an old family photo which she is trying to identify. Her family has connections with the Wolverhampton area, and with Somerset, but of course it may not be in either. She believes that it's possible that the photo is a mirror-image of reality, so I've included two versions of the photo - 1 (the original), 2. Another one from Geoffrey Tucker - there are no clues at all for this one. Can you place it? 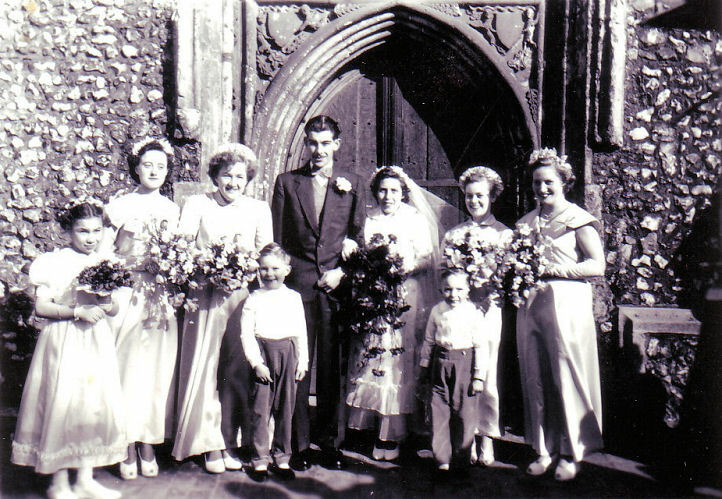 A tough one from Avril Hodgkins - it shows a church door and a wedding party. It would help Avril's genealogical researches if she knew where the church is. 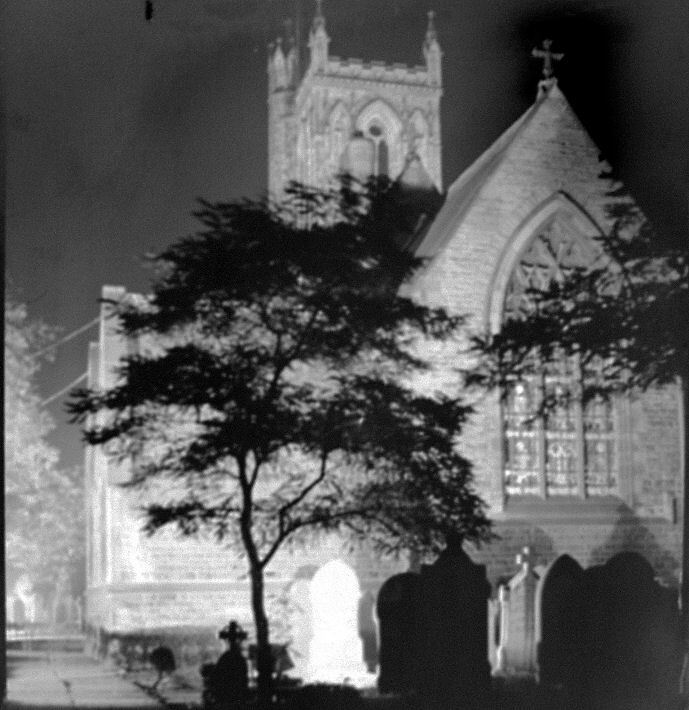 Written on the back is "Late Evening Service, St. Mary's Church", and a date of the late 1940's or early 1950's seems likely. 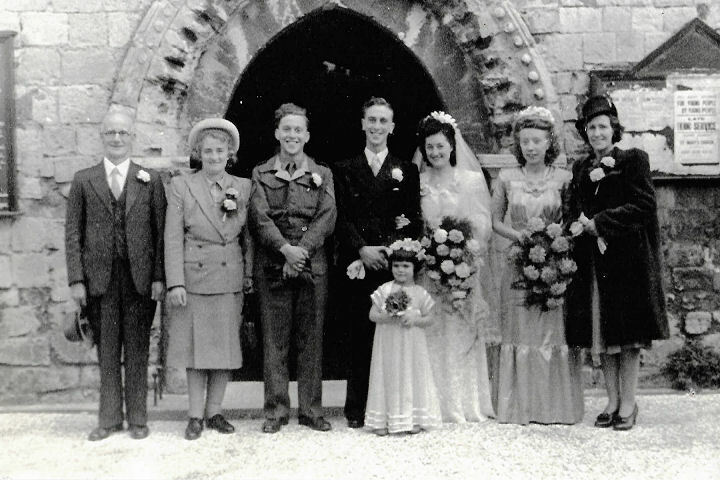 She thinks the bride may be Margaret Davies, who was connected to the Bangor (Wales) area, and who later lived in Worksop. Can you help her? Another old family photo, from David Haworth. 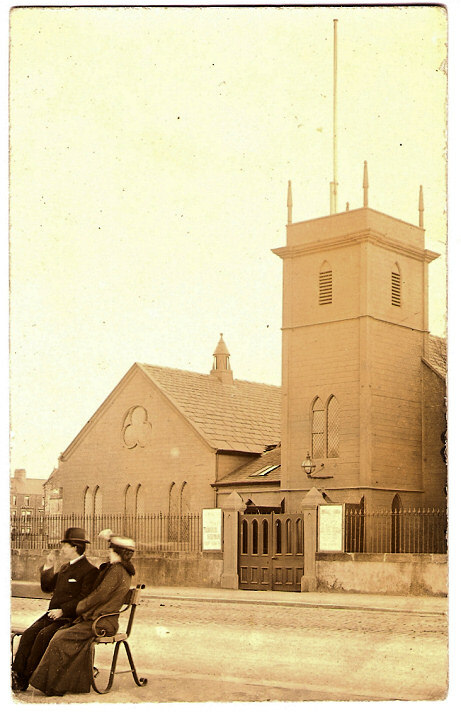 Found among his dad's photo collection, this church was obviously important to him, and David would like to establish where it is. The most notable thing is the gate standing on stone piers, with a small building immediately next to it. It may possibly be in the north-west of England, or North Wales. David has identified this through his own efforts, and it's St. Martin at Bladon, Woodstock, Oxfordshire. Recently Solved (Older solved Unknown's have been archived here). Aberdeen, Aberdeen City, King's College Chapel on High Street. Jan Bradley had sent me some scans of old stereoviews. This one was identified by Phil Draper. Phil was able to date one of the others as being of pre-1873 vintage, so this one is probably of a similar date. Link. Avebury, Wiltshire, St. James. 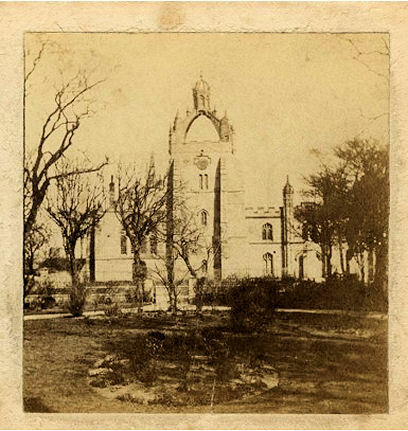 Christopher Skottowe has an old album containing (among other things) a photo of a church. The photo dates from circa 1893. Identified by Phil Draper. Barnsley, St. Peter the Apostle and St. John the Baptist. An old photo sent in by Mike Jones, and identified by himself a little while later, and by John R. Parker. Despite my prognostication that it looked R.C., it is in fact Anglican. Link1. Link2. Barnwood, Gloucester, St. Lawrence. Jan Bradley had sent me four scans of old stereoviews. 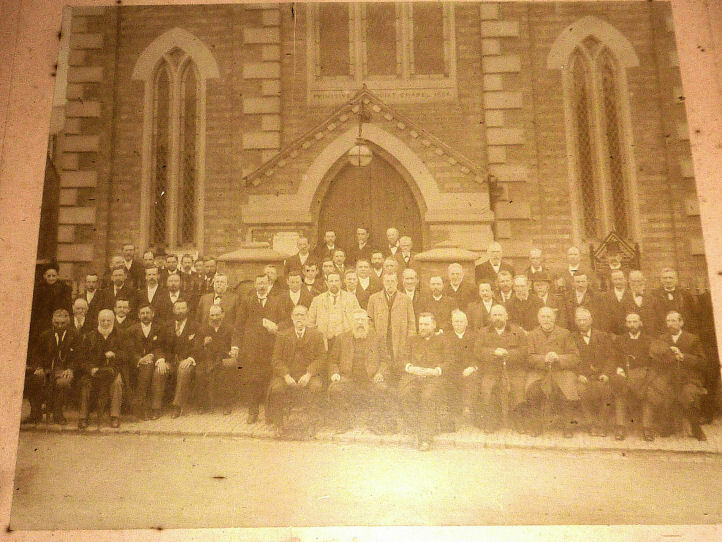 Identified by Phil Draper, he dates the photo to pre-1873, when the church underwent some re-building work. Barton upon Irwell (now Salford), St. Catherine. This is another postcard (interior) from Judy Flynn. The only clue was that written on the back is "Barton, Lancs." There are at least 2 Barton's in Lancashire. Although Brian Curtis had suggested Barton-on-Irwell, St. Catherine, he (and I) were unable to find an image to confirm the suggestion. He listed a number of points, cumulatively suggestive, including architectural appearance (correct for the known date of St. Catherine - 1860's), and similarity of the lancet windows as shown here. Some more photos of St. Catherine are shown here (search for "Barton"), but they aren't helpful. 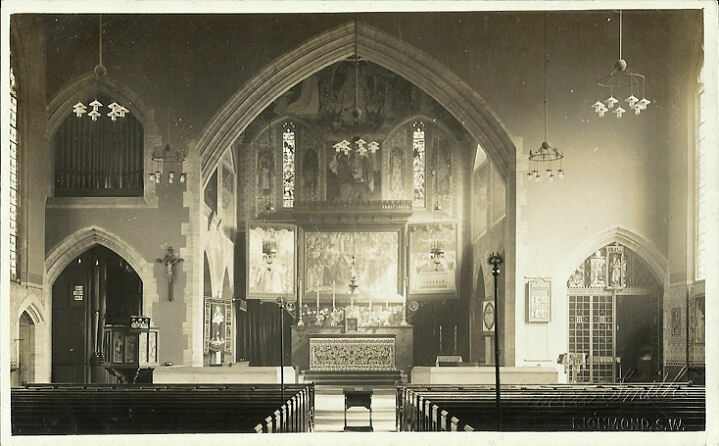 Final confirmation came from Phil Draper, who found a scan of a postcard for sale on E-Bay showing the interior of St. Catherine, Barton-on-Irwell, confirming the identification of Judy's postcard. The E-Bay scan has a digital watermark, so I'm unable to reproduce it here. Blackheath, Surrey, St. Martin. 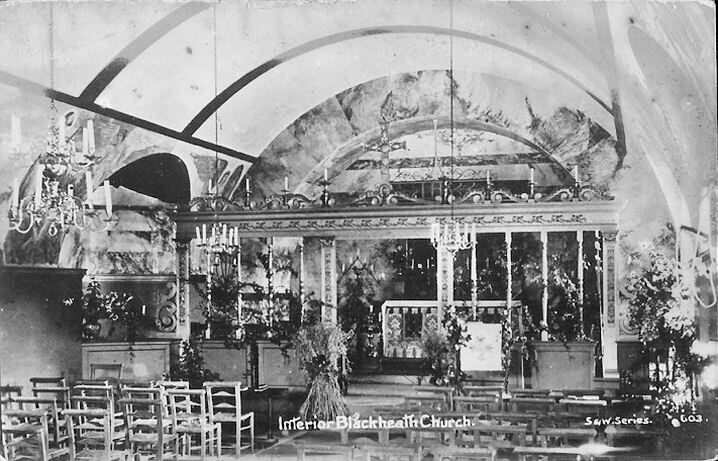 Another old postcard from Judy Flynn, showing the interior of "Blackheath Church". Identified by Phil Draper, Janet Gimber and Tony Preston as the Surrey Blackheath, my suggestion that it may have been a tin tabernacle proved to be wrong. Link1. Link2. Link3. Link4. Bosham, West Sussex, Holy Trinity. 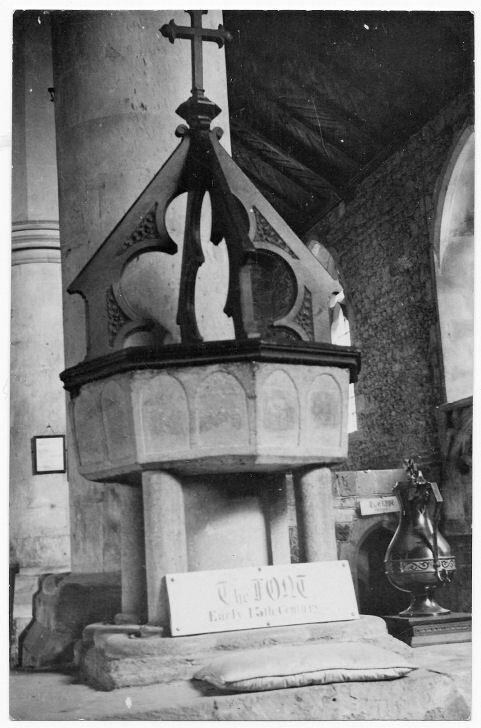 John Bowdler was looking for the location of the font. 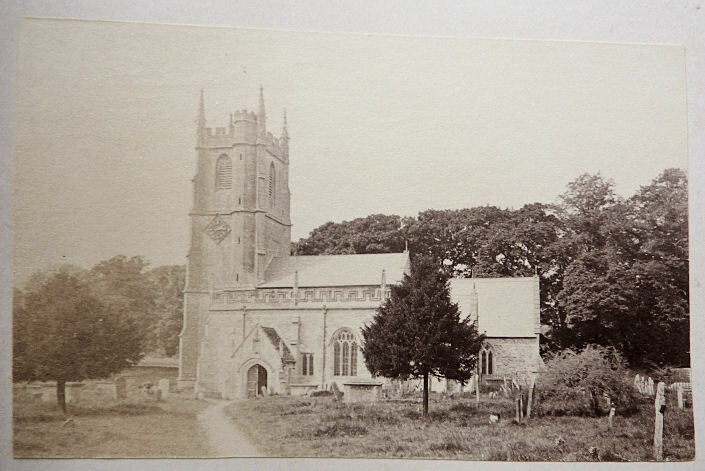 Though the postcard offered no clues, Simon Davies managed to identify it. Link. Burnham-on-Crouch, Essex, St. Mary the Virgin. Jan Bradley had sent me some scans of old stereoviews. This one was identified by Phil Draper. Phil was able to date one of the others as being of pre-1873 vintage, so this one is probably of a similar date. Link. Grade II* listed. Carisbrooke, Isle of Wight, St. Mary. 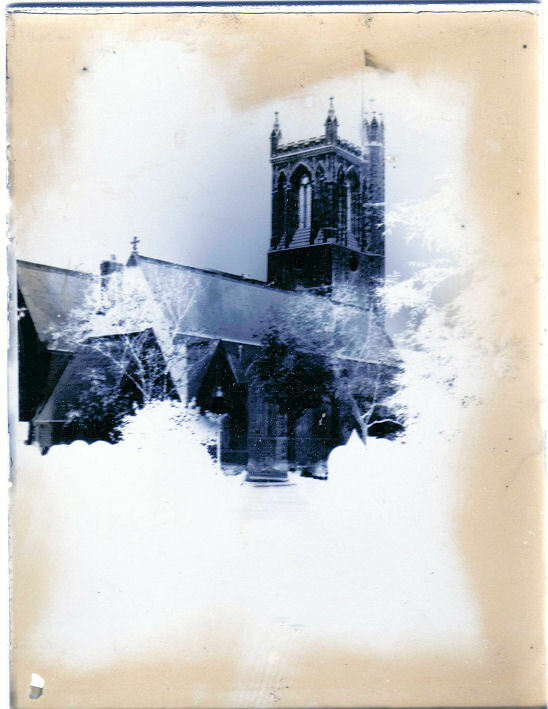 Elizabeth Moore was looking for help in identifying the church on a photo bought at a sale in Kettering. This is an enlargement, but the original has written by hand on the front "Photo taken in 1964", though additional writing on the back implies a 1950's date. The church itself is evidently large, and the multi-stage tower with external staircase is distinctive. Note particularly what appears to be a middle pinnacle projecting outwards from the face of the tower - a most unusual feature. It was identified by Phil Draper, and Elizabeth herself. Chilham, Kent. 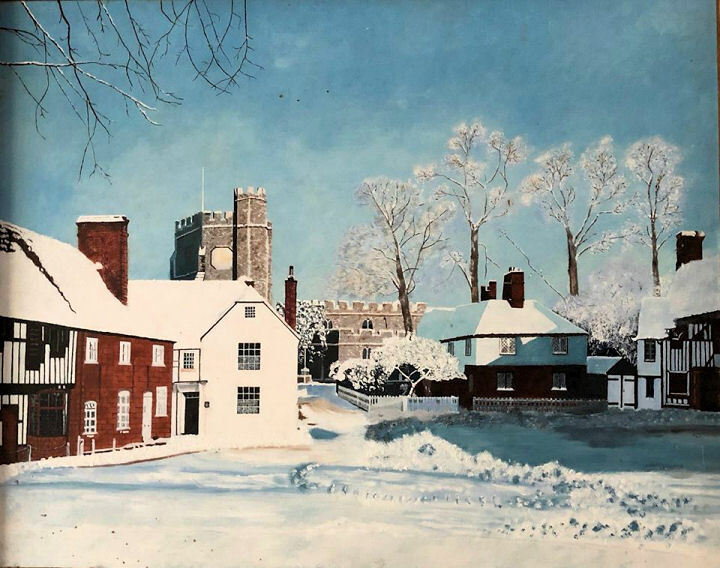 Another painting, of a village in the snow. Sent in for identification by Norman Boyd, he managed to identify it himself. Chilvers Coton, Warwickshire, All Saints. 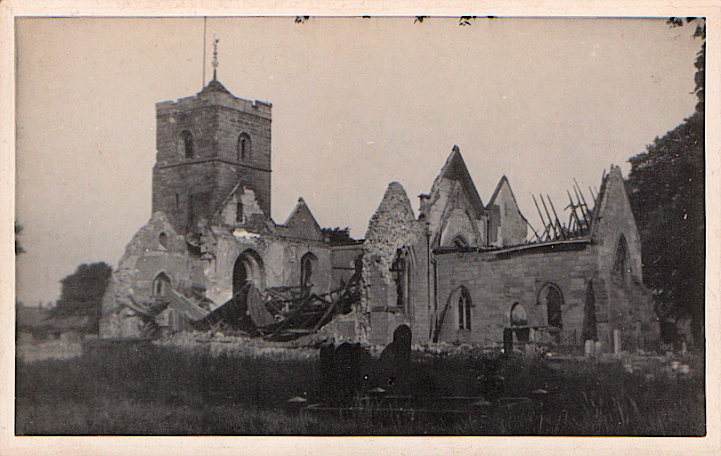 One of Brian Curtis's postcards, showing a fire damaged or bombed church, and has been identified by John R. Parker, who advises that the church was rebuilt by German POW's in the 1940's. Cirencester, Gloucestershire, St. John the Baptist. An old postcard from Michael Steingold, identified by Phil Draper and Bill Davison. Coldridge, Devon, St. Matthew. Curiously, I received scans of two different postcards of an interior (1, 2), from Judy Flynn and Brian Curtis, within days of each other. I suspected immediately that they were of the same church, but had no idea of where it might be. 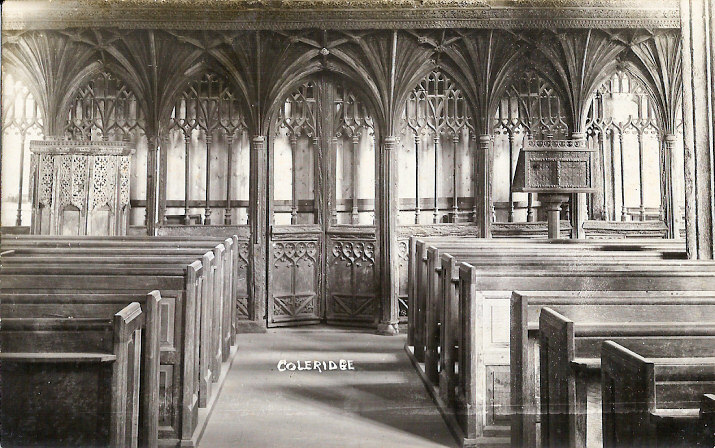 One postcard had the word "Coleridge" printed on it, and it seems that this was the old spelling for what is now Coldridge. Greg Mishevski and Simon Edwards obliged with the identification, and confirmation that they were indeed of the same church, and provided the following links - link1, link2, link3. There are some older references to the church dedication being St. Mary (Simon refers to a 1919 Bligh Bond book). The church is Grade I listed. 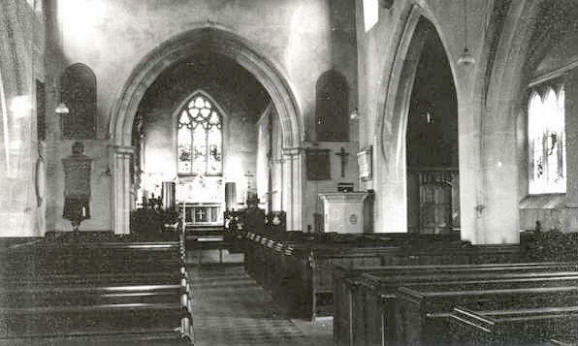 Compton, Hampshire, All Saints (interior). 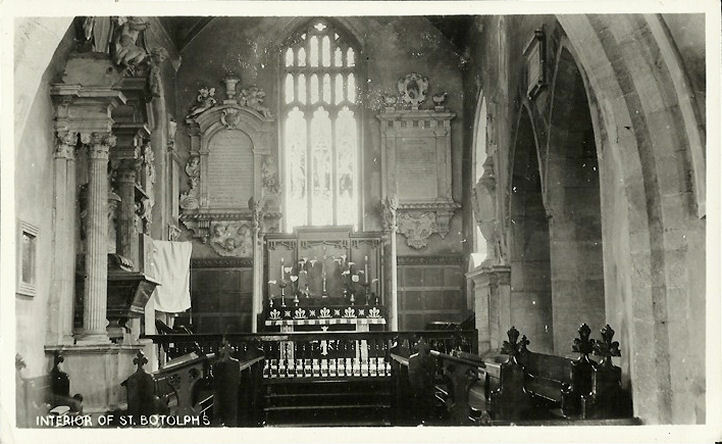 An old postcard from Judy Flynn's Collection, this interior is labelled as Compton. Identified by Janet Gimber. The photo proving the identification is not available to use or link to. An external photo is available here. Grade II* listed. Edinburgh. 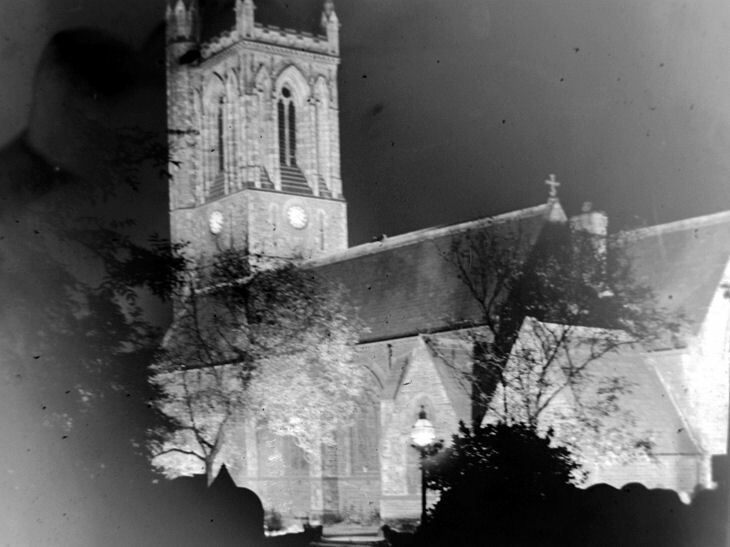 Mike Sells wanted help in identifying a building on an old glass negative, allegedly of a church, probably in the Edinburgh area (as others from the same set have been identified as such). Another negative has a date of 1898. Now solved - Janet Gimber has proved that this is an old house (still in existence), and the details have been passed on to Mike. Eton, Berkshire, Eton College Chapel. An old image from Christopher Skottowe's Collection. 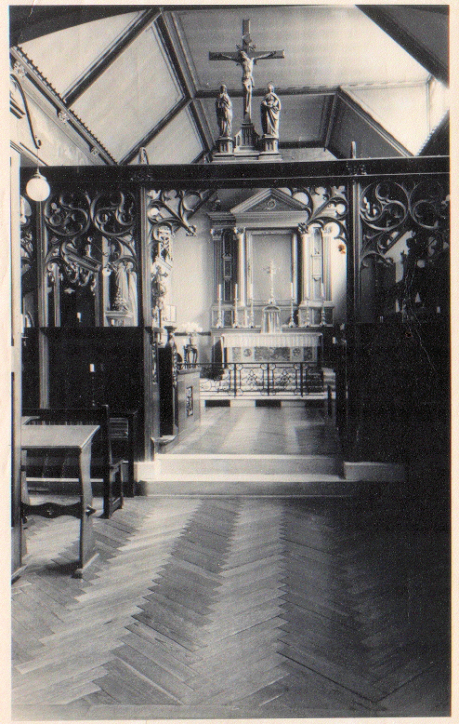 Identified by Phil Draper and Tony Preston, the image shows the chapel as it was before the wooden ceiling was replaced with fan vaulting in the 1950's. From Judy Flynn's Collection. This damaged and very faded postcard (I've had to process it quite hard) is of Ebenezer Baptist Chapel in Fleet. It was published in Basingstoke. 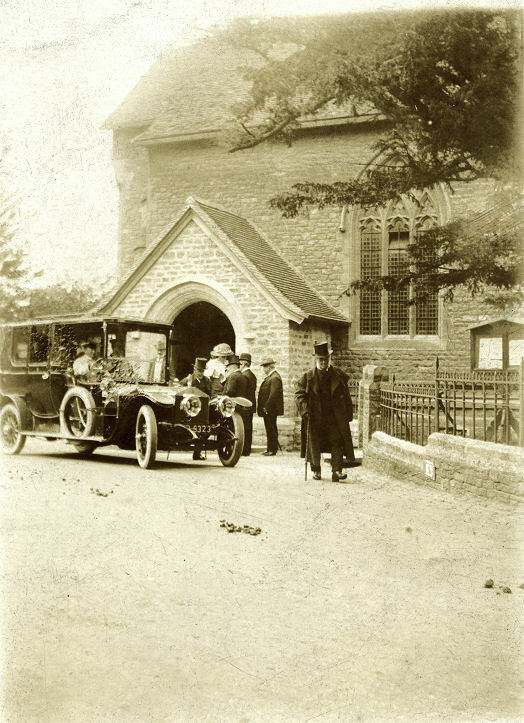 Janet Gimber has confirmed that this was Fleetpond Baptist Chapel (aka Ebenezer) on Reading Road, Fleet, Hampshire. This link shows it too; the house next to the chapel is still standing, though the chapel has gone, replaced by a car park and office block. 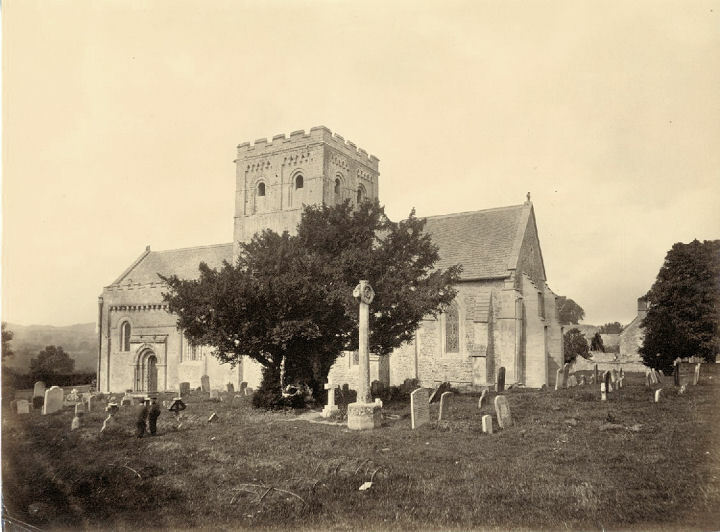 Fritton (near Lowestoft), Norfolk, St. Edmund. 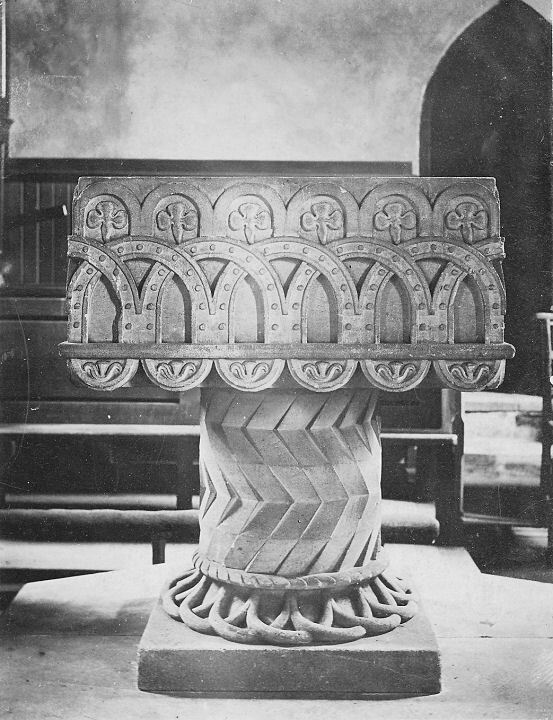 A highly decorated font (photo from John Bowdler's Collection), which I took to be on a Norman column (which is similar in design to columns in Durham's Norman Cathedral) was identified by Simon Davies, who advises that it is in fact Victorian. Link1. Link2. Froxfield, Hampshire, St. Peter (1862) at High Cross. An old postcard from Mike Jones, and identified by Brian Curtis and Simon Davies. It no longer has the patterned roof. Link. Fugglestone, Wiltshire, St. Peter. Sent in by Paul E Barnett, it was identified by Phil Draper. Grantham, St. Wulfram on Church Street. 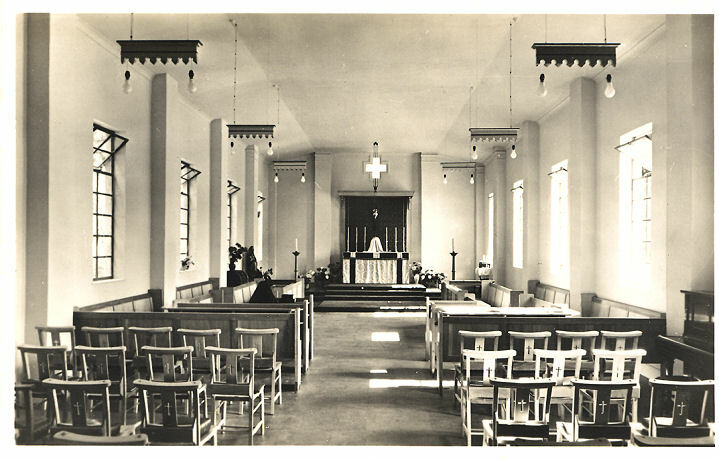 Another old postcard from Judy Flynn's Collection of a church interior. The text above the altar reads "Unto you is born this day a Saviour which is Christ the Lord". 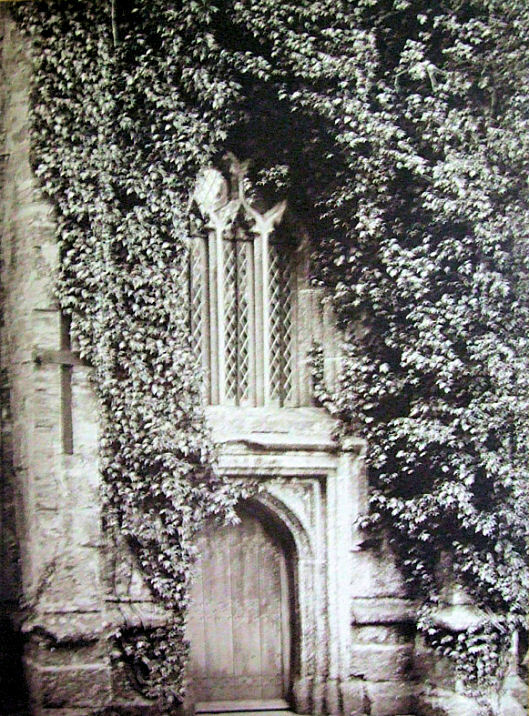 Solved by Janet Gimber, and the proof is here - http://www.discoverstwulframs.org.uk/, then choose the “Gallery” tab, click on “Victorian Restoration”, and the same image is presented. Hastings, East Sussex, St. Matthew at Silverhill. 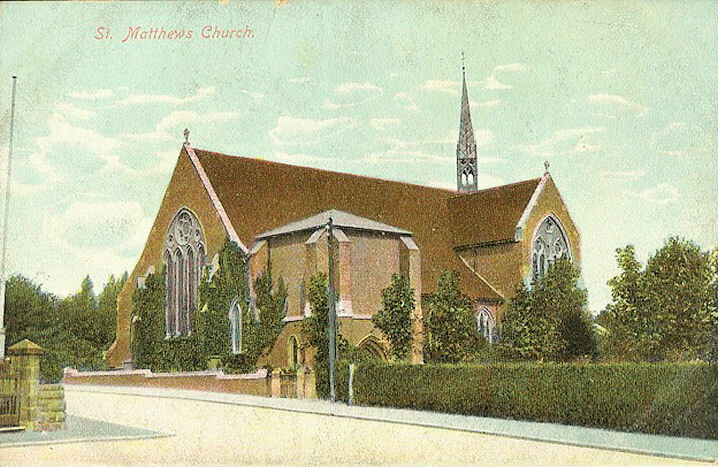 An old postcard from Judy Flynn's Collection, this view of St. Matthew's Church offered no clues to its location, other than that it was published by The London View Co. It is fairy distinctive, with an unfinished (or demolished) porch/tower, and a small lead(?) spire. Identified by Janet Gimber and Simon Davies. Note that the location of this church can be confusing - for example, Wikipedia has it at Silverhill, Hastings (link), but the church website says it is at St. Leonards-on-Sea (link). High Hesket, Cumbria. One of Brian Curtis' postcards, this was identified by John R. Parker. 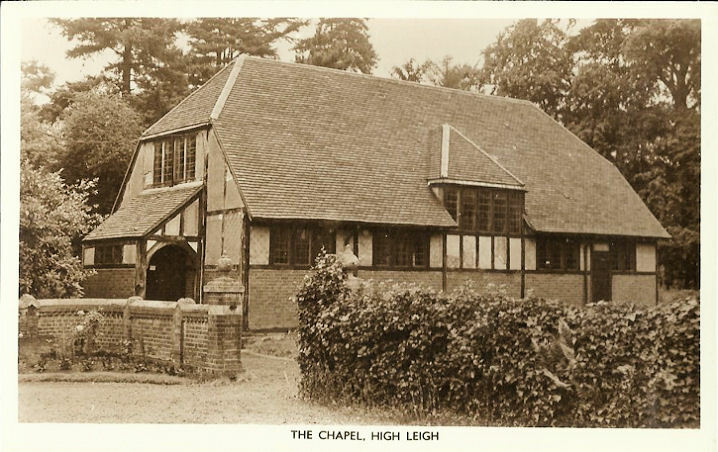 The Chapel, High Leigh is from a postcard in Judy Flynn's Collection. 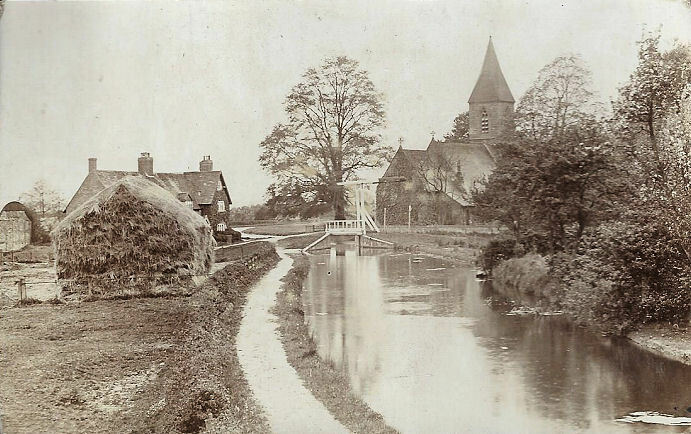 Janet Gimber and Brian Curtis have both confirmed that this is the High Leigh near Hoddesdon in Hertfordshire, to be precise, at the High Leigh Conference Centre. Using Bing maps to look at the postcode EN11 8SH, and zooming in onto the cross on the Ordnance Survey map option, just above the text "High Leigh", then switch to the birds-eye view, you can see the building apparently unchanged from when the postcard photo was taken. Hughenden, Buckinghamshire, St. Michael and All Angels. Christopher Bray is writing a biography of the film director Anthony Mann, and wanted to identify the location of a church which was featured in the film A Dandy in Aspic, some stills of which are to be found here. Brian Curtis and Simon Davies both identified it. Iffley, Oxfordshire, St. Mary. Previously in the Unknown section, this is from Peter Langmaid's Collection. There appear to be some metal frames over some of the nearby graves, which Peter suggests may be body-snatcher deterrents. It was identified by John R. Parker. Link. The surprisingly short Grade I listing. Isham, Northamptonshire, St. Peter. 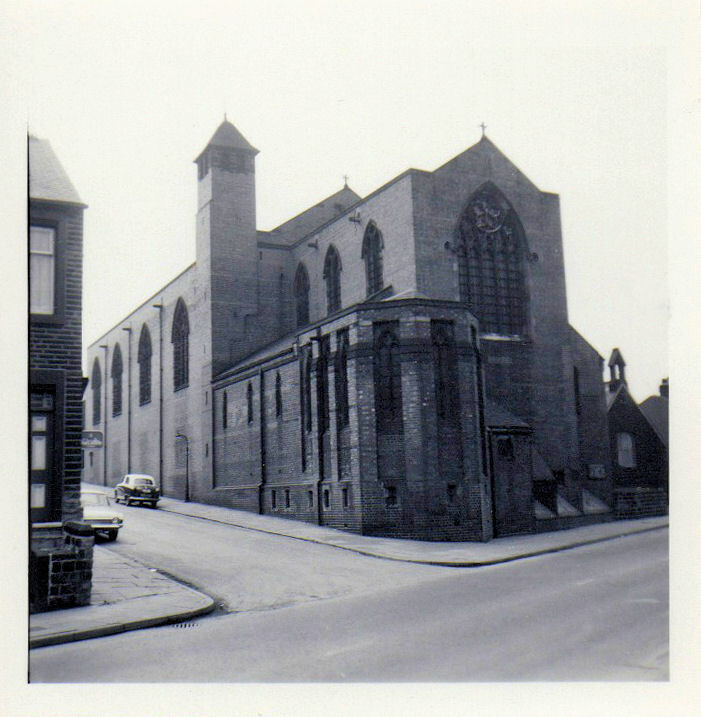 Claudio Sanfilippo took a trip between Luton and Leeds in 1977, and photographed this church. My appreciation to Simon Davies who identified it. 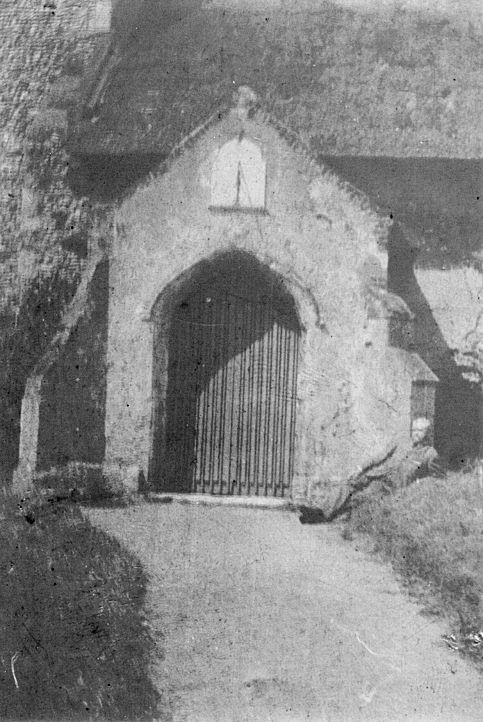 Loders, Dorset, St. Mary Magdalene. Cris Tyler was trying to identify a church for a friend, which was thought might possibly in the Leeds area). Phil Draper made the identification. Link. Grade I listed. Lowestoft, All Saints and St. Margaret at Pakefield. Long in the Unknown section, this old family photograph from Lyn Thomson's Collection was identified by Janet Gimber. Compare with here. Link1. Link2. Marlborough, Wiltshire, St. Peter. An old stereoview slide from Jan Bradley's Collection. I though it had a west-country look about it, and this was confirmed by Phil Draper who identified it. 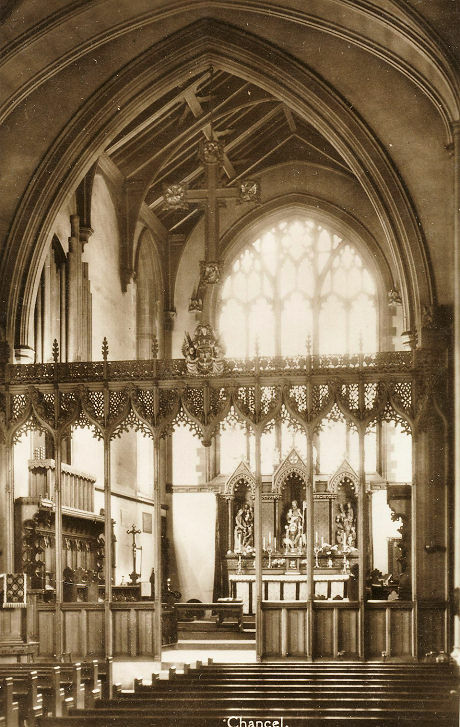 Market Lavington, Wiltshire, St. Mary of the Assumption (interior). A postcard from Ray Harrington-Vail's Collection, this one remained unsolved for several years. My appreciation to Phil Draper for identifying it, and supplying this link to one of his own photos as proof. Link. Grade I listed - link. 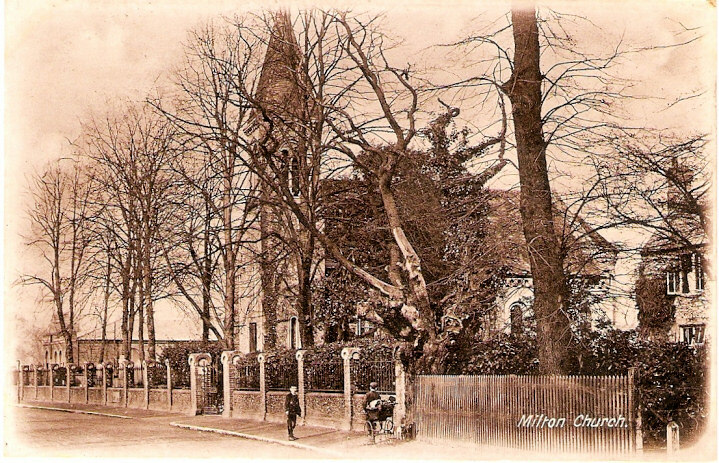 Milton, Portsmouth, the long-demolished St. James (1841). Seen here in a postcard from Judy Flynn's Collection, it was identified by Brian Curtis and Simon Davies. Proof of its identity can be seen in the Google Earth view of the present church, by comparing the pillars and wall with those in the postcard. 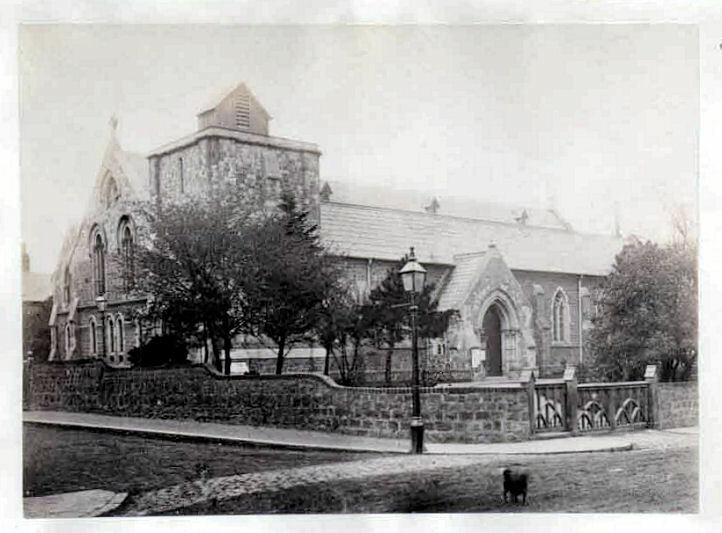 It was demolished to make way for the present day church, consecrated in 1913. Muckross, Holy Spirit. 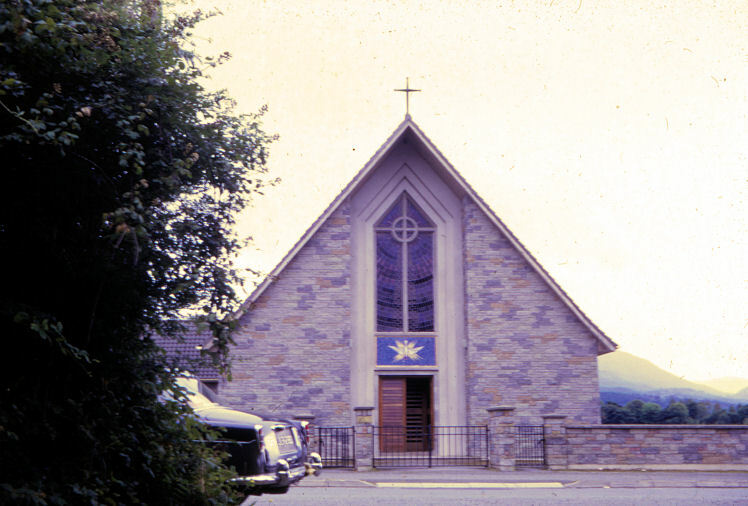 An Irish church, from Chris Scales' collection - an old family holiday photo from a 1970 holiday. Tony Preston identified this mystery church. Notting Hill, Greater London, St. Peter, on Kensington Park Road. 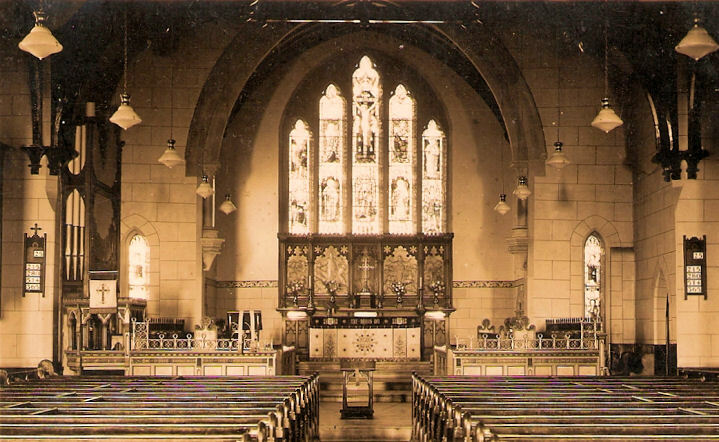 One of Judy Flynn's postcards, the caption reading St. Peters Church W. Identified by Simon Davies and Michael Day. Link. Grade II* listed. 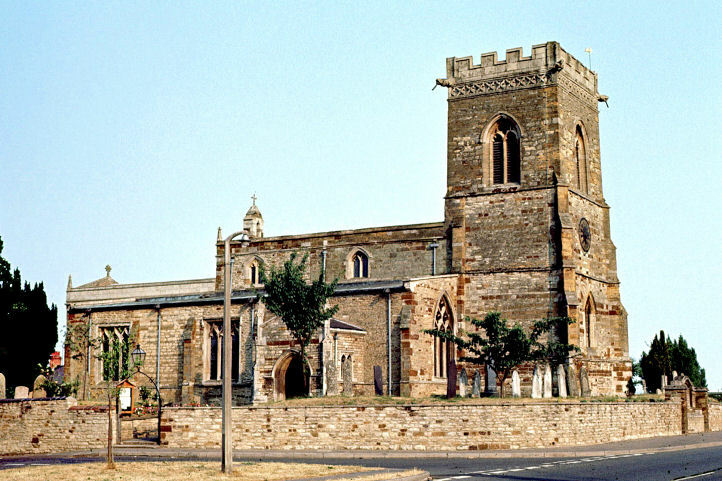 Owthorpe, Nottinghamshire, St. Margaret. 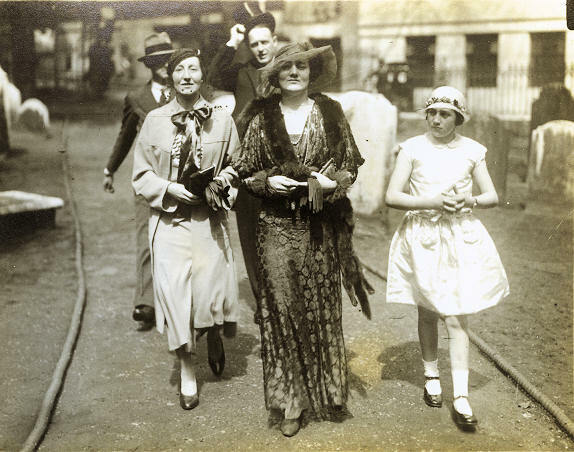 An old family photograph in Michael Badger's Collection. It dates from circa 1925, and was thought to possibly be within day-trip distance of Kinoulton in Nottinghamshire. And so it proved. The identification was by Tony Preston. Paris, France. An old stereoview slide from Jan Bradley's Collection was suspected of not being British, and so it proved. Phil Draper and John R. Parker both identified it as St. Etienne du Mont. See here for confirmation. Queen Charlton, Somerset, St. Margaret. Jan Bradley had sent me some scans of old stereoviews. This one was identified by Phil Draper. Phil was able to date one of the others as being of pre-1873 vintage, so this one is probably of a similar date. Grade II* listed. Richmond, Greater London, St. John the Divine. A postcard from Judy Flynn. Note the large triptych. Printed at lower right is Richmond S.W., so presumably the Richmond formerly in Surrey, now in Greater London. Janet Gimber identified it as St. John the Divine, Richmond, Greater London, and provided this link for comparison (scroll down the page). Link. Rotherfield, East Sussex, St. Denys. One of Judy Flynn's old postcards, it was posted from Tunbridge Wells to Boscombe in 1905, and written on the back is "This photo was taken the day after our harvest thanksgiving." Interiors are always difficult to identify, so my thanks to Simon Davies for identifying this, and supplying the following confirmatory link. St. Bees Priory, Cumbria. 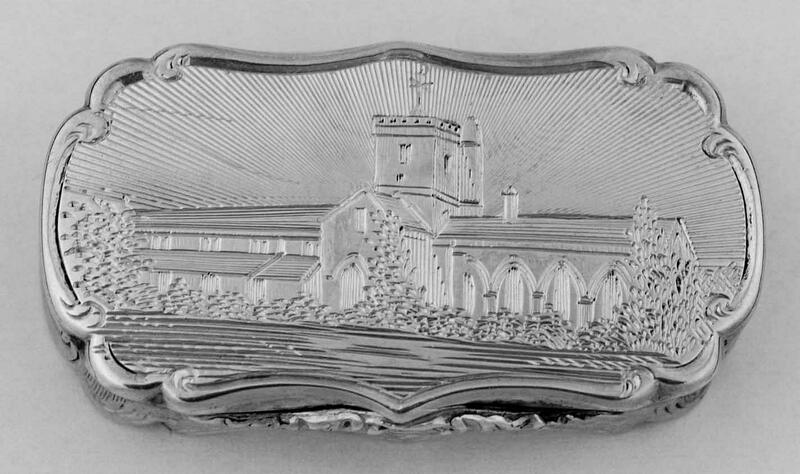 This Victorian silver box belonging to Peter Cameron has a church on the lid. Note the tower design. Can you name it? After languishing for years without any suggestions at all, Rob Robinson has proposed St. Bees Priory in Cumbria (properly the Priory church of St. Mary & St. Bega), and offered the following link in support - link. I think the suggestion is a good one. Peter has since drawn my attention to this page, and in particular the right-hand illustration towards the top, which may well be the source used for making the silver box. 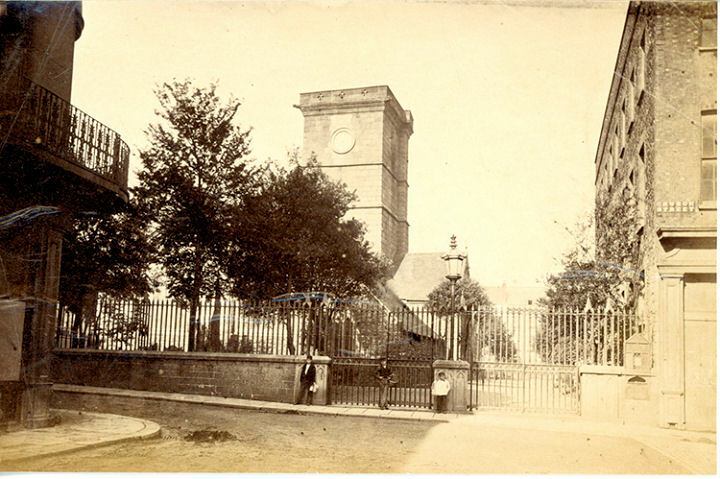 St. Helier, Jersey, the parish church, identified by Phil Draper. From Peter Langmaid's Collection. Shepshed, Leicestershire, St. Botolph. An old postcard from Judy Flynn's collection, identified by John R. Parker. However, a mystery remains. Judy has compared the image on this link (as provided by John) with Streetview, and has pointed out that the window (presumably East window) looks different. 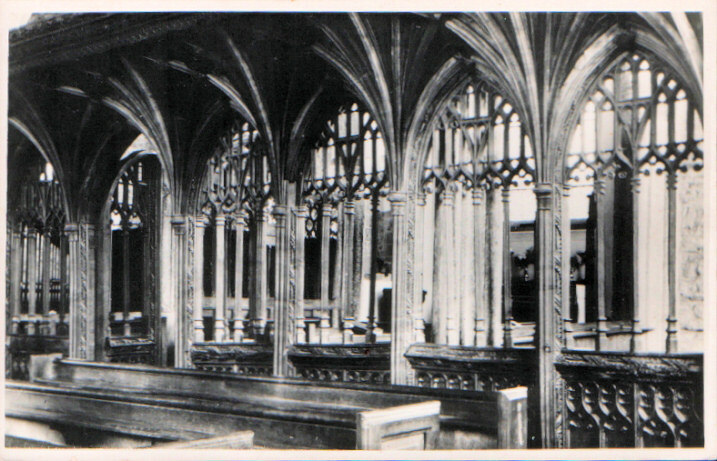 The old image and the postcard (interiors), show three lancets, with two rows of smaller windows above. Streetview/Google Earth (exterior) shows what appears to be the same window, but with five lancets. John R. Parker has advised of this link (p. 289), which says that "The East window, of five lights, has been partially blocked by two of the Phillips monuments,......". Judy Flynn has contacted the church and received a helpful reply, and Brian Curtis has also been researching this church. The following summarises the fruits of their labours. The window was dedicated to a member of the de Lisle family (a vicar). They could only afford to install the central three lights, and had the outer two blocked up on the inside. Monuments were later added to either side of the remaining three lights. The outer lights were still visible as plain glass from the outside. 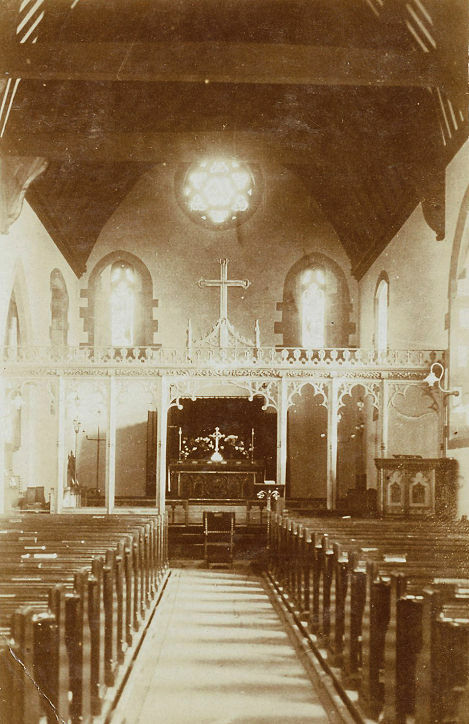 This pdf document describes the church as it was, and has an interior photo showing the monuments in place, with the 3-light window. 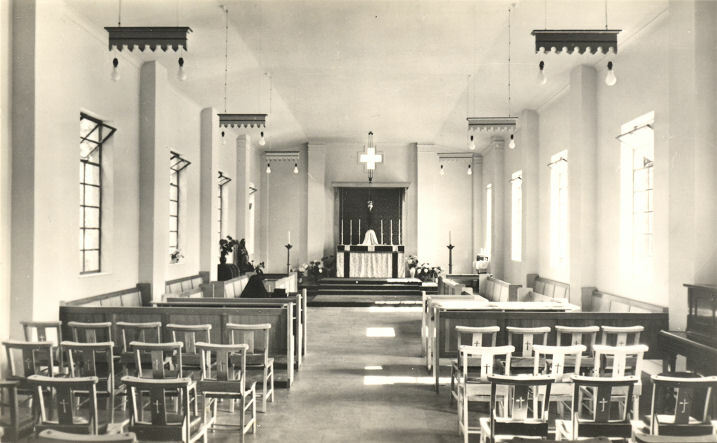 In more recent years, the monuments erected behind the two outer lights were moved elsewhere in the church, the church re-ordered, and the in-fill removed from the windows, revealing the outer lights again. More modern photos here. Link. Grade I listed. Sunningdale, Surrey, St. Alban. 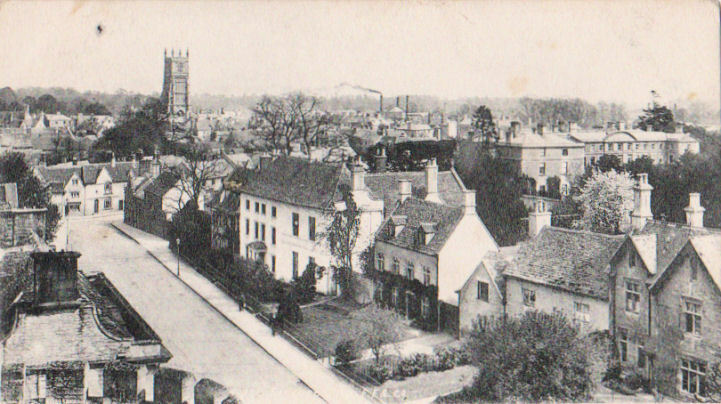 Another postcard from Judy Flynn's collection, it was thought that it might possibly be the demolished one mentioned here (just beneath the church photo). The postcard was posted in 1905. 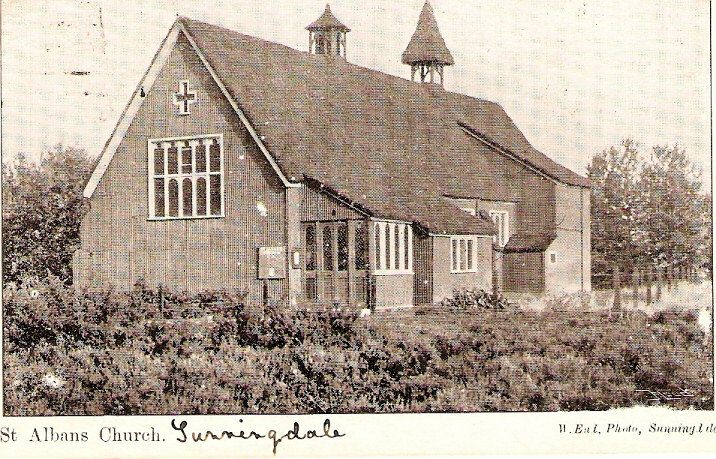 Howard Richter advised that the footprint of the church in the postcard is not contradicted by map evidence, and the grid reference would have been SU 943 660. It appears to have been built between 1900 (not on a map of that year), and before 1915. Another old postcard shown here (scroll down) is again entirely consistent with this being the Sunningdale St. Alban's. 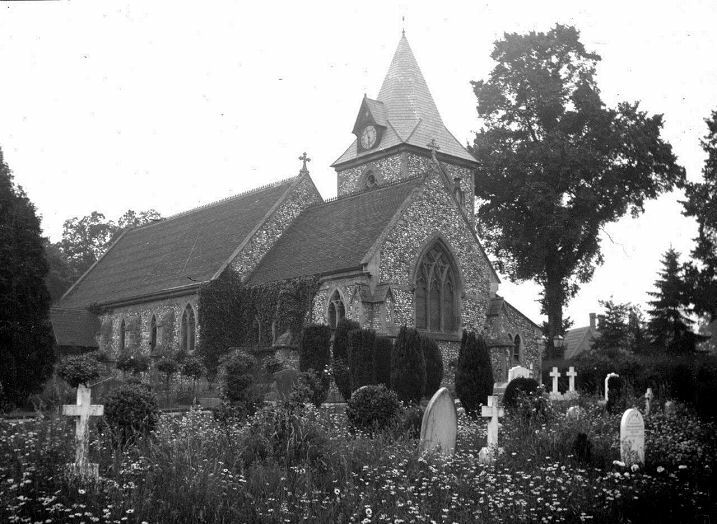 It also says that it was a daughter church to Windlesham (St. John the Baptist). Q.E.D. Swinton, St. Peter Apostle and Martyr, identified by Simon Davies. Identified by Simon Davies, these old glass negatives (1, 2, 3) are in John Davies-Allen's collection. 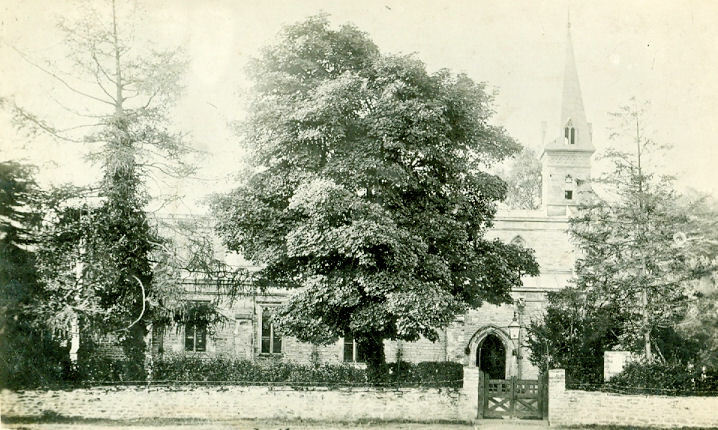 Thurning, Northants, St. James, on an old postcard from Reg Dossell's Collection. Another one of long-standing solved by Phil Draper, who supplied these confirmatory links - link1, link2, and I've also found the following, link3. Waltham Abbey, Essex. 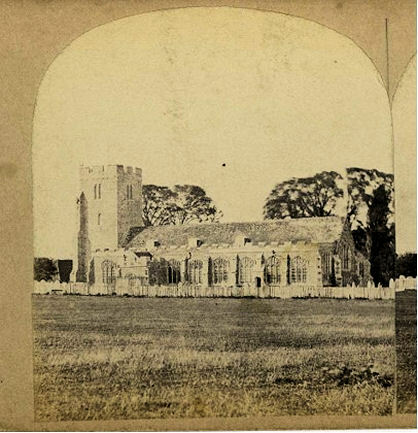 Christopher Skottowe has an old album containing (among other things) a sketch of a churches. Though there's no indication of the date of the sketch, it is probably from late Victorian times. 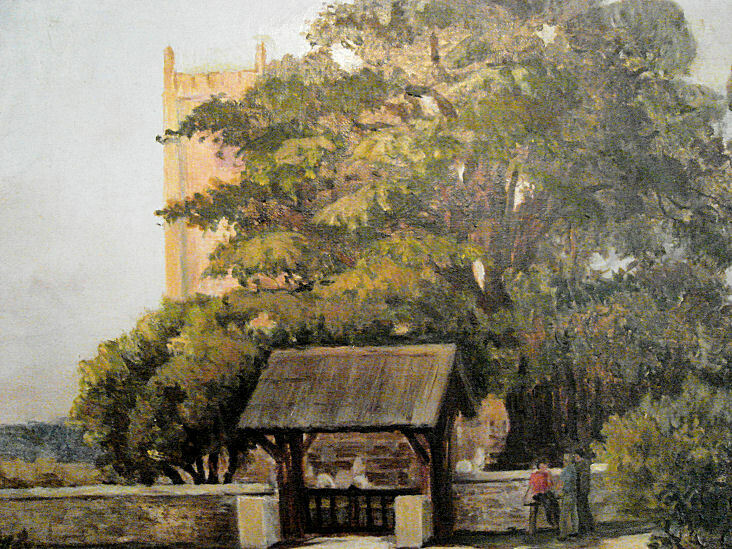 Simon Davies has identified it as Waltham Abbey in Essex, before Victorian alterations increased the height of the tower. Whittlesey, Cambridgeshire. 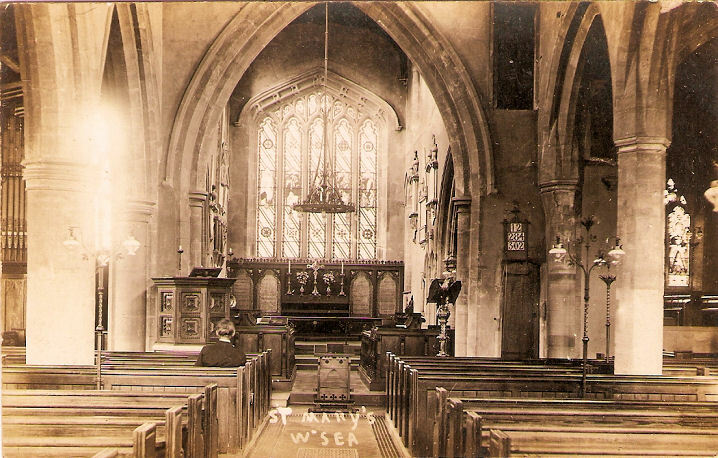 Judy Flynn has an old postcard of a church interior, and labelled as "St. Mary, W'sea". It was bought understanding that it was in Yorkshire, but have been unable to find a likely candidate. Thanks to Phil Draper and Simon Davies for the identification. Older solved Unknown's have been archived here.